On summer break at Universal Studios with the 8th graders of course. Technically, they aren't 8th graders anymore. Wouldn't you love to have one of these? This is the truck used in the movie "O Brother where Art Thou". I decided to sit on the running board because my feet were hurting from all the standing and walking. Some of the medications they had me on a few years back have really taken their toll and I'm feeling old before my time. I've clipped out everyone else in the photo since I didn't ask parent permission to show anyone. We had a lot of fun. My favorite part of the day.... was at the end of the Jurassic Park ride. I also enjoyed the studio tour. Have a restful summer. Here is a short cut back to page 4. Materials storage not a problem anymore! The old shop had a storage problem (not large enough and mostly still in the weather), so when I have been saying that all our materials are free donations from the cabinet shop, free may not be the best way to describe it. When you have to drive over and spend time going through and picking up the cast off materials, then find a place to store them, that adds to the handling and cost, especially when the rain could get into that area and ruin a lot of the stored items. I ended up continuing to store a lot of the materials at home. What a teacher is willing to do for their students and school.... but no shop fees, no monetary cost to the students or parents, and lots of fine materials that.... still seem free. Having lived through the changes to "no shop fees" at my previous job, I have to say that was very detrimental to the students motivation. They just didn't seem to care the same way as they did before, when they had some investment into the process. I was determined to not let that happen here and that is partly why the project ideas simply had to be.... "cool"... to keep the students motivated. When we moved to the new shop... I was given a better storage area (small yet weather tight) but what materials I had at school was.... in the confusion... allowed to be haphazardly placed by helpers who didn't know any better than to pack it to the point where it was difficult to get anything. With my priority at the time... being to set up the shop... it wasn't until the last few weeks of school that I was finally able to straighten up some of that mess. This created quite a bit of room, so after completing some significant home improvements during my time off this month, I was able to move almost everything I had been keeping for school use at home. Finally, my home shop has it's floor space back, and my shed has extra shelf space..... and storage under my house is back to normal. The shop storage area.... is for the most part... full to capacity with all types of solid hard woods and sheet goods. I'm looking forward to starting school in an organized shop for the first time since coming to Franklin. No more shop equipment, materials, or classes out in the weather. 6-30-15 Wow.... speaking of keeping out of the weather, we had a local storm yesterday evening which flooded streets and also had marble sized hail built up like snow around parts of town. The trees were badly pelted, their leaves were all over the side walks. The school called to tell me the wood shop floor was one third covered in water, the electrical out, and the alarms were going off all over campus. I went over today and it looks like most of the water has been cleaned up, but a few cardboard boxes on the floor were completely soaked. I should have emptied those boxes right then because it completely ruined some of the pieces I cut for the cutting boards project. Turned them colors and I wouldn't want to use them now. It also left a musty basement smell in the shop that took a while to subside. One of my tasks this summer was to deep clean the house and my home wood shop. In the process I came across a treasure trove of previous projects which I made to inspire my students over the years. I thought this might be a good time to showcase some of them, especially since I haven't had time to make any new projects lately. I'll photograph them and post them as I get a chance. 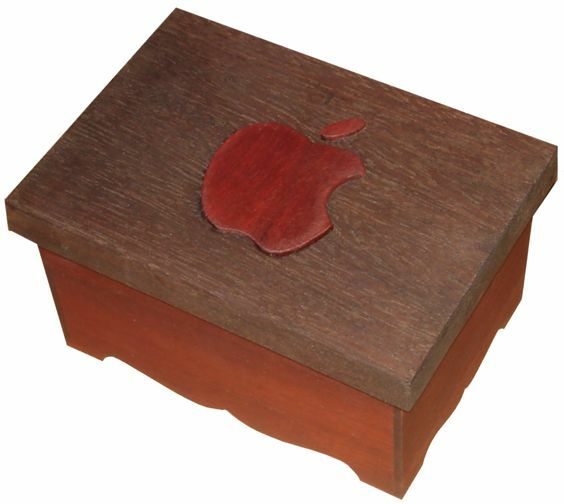 This I-pod storage box is made from Blood Wood and Peruvian Walnut. The top is about 6" X 8". The apple is first routed in and sticks up from the surface. This was one of my high school projects for students who had difficulty coming up with their own project design. I would also let them laser engrave their names into the backs of their i-pods and phones. Although i-pods have changed a little since then, I'm absolutely sure if I brought this to class on the first day, I would have a lot of Franklin students wanting to make it too. It's a great small project to keep them interested and for them to keep their smart phone or i-pod accessories. 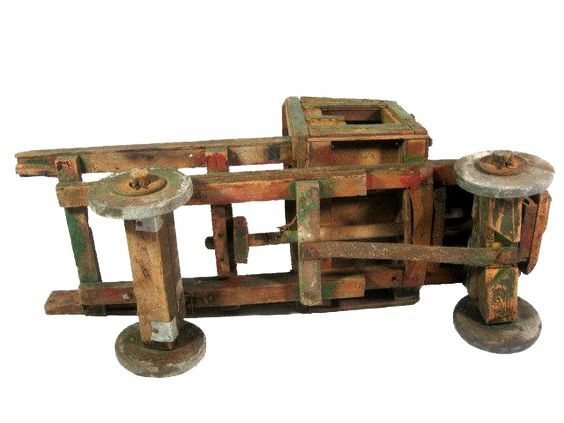 Another previously made project... this rat trap made a powerful yet amazingly simple to make vehicle, but the original wheels were scavenged for another project many years ago. I had to make replacement wheels and axles so these wheels don't have that vintage look that you can see on the rest of the vehicle. Oddly enough the original fishing line still works. 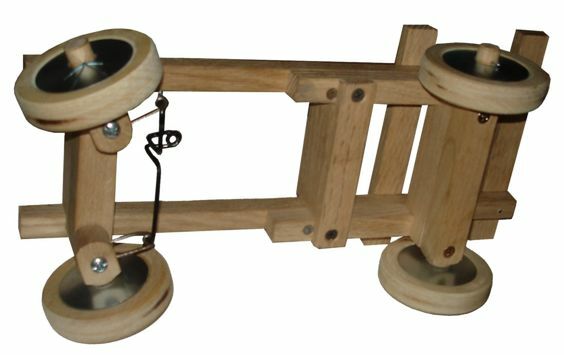 On this particular model (made with my daughter for a class project when she was in elementary school) the fishing line is going back and forth over the trap which not only lengthens the fishing line but also slows the car down increasing the run time so it actually travels further without huge wheels. The spring is powerful enough that the line doubles back twice for extra length. The trap is strong enough to keep pulling until it runs out of line. After stringing up the new wheels, I wound up the car and set if free across the living room rug and off it went. Once it reached the edge of the rug and hit the wood floor, the wheels lost traction and you could hear them spin against the wood, but the car kept going down the hallway before being stopped by running into a doorway about 30 feet away where the wheels kept spinning until it ran out. I toyed with the idea of re-making it into a 4 X 4 with deep tread tires because it might be strong enough to run in dirt and sand. 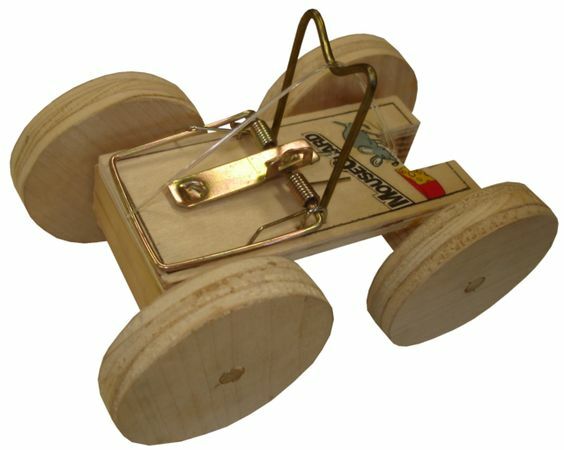 When I first started making these 35 years ago, mouse trap cars weren't a new idea, but it was such a cool idea that I had to make one up so my 7th & 8th graders could also start making them. In those days we used old manilla folders to layout a body style to go over the chassis. It was the same method used to do sheet metal. Complete with glue tabs, the body was bent into shape and had to fit over the trap. We had a drafting class too. That year the favorite vehicles in Coolidge Arizona (my first teaching job) were raised 4 X 4 trucks and low riders. 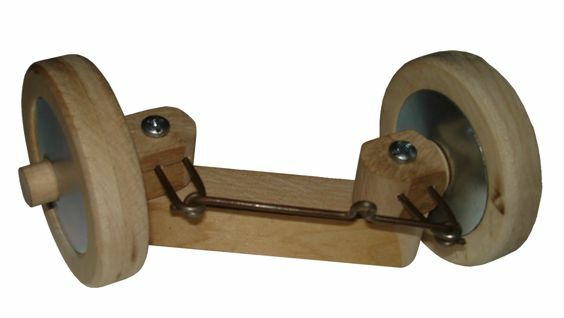 The wheels are 2 3/8" in diameter and the axles are attached using a small screw eye (just large enough for a 1/4" dowel). A spacer (this one is made from copper tubing) reduces friction by keeping the wheel from rubbing against the side. To make them look raised for a 4 X 4, we put extra blocks underneath before installing the screw eye to hold the axle. 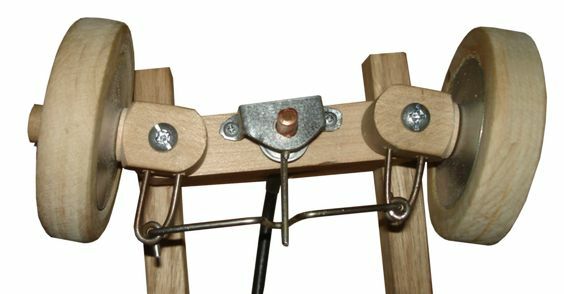 To save on materials, you could eliminate the screw eyes and copper tubing by drilling the axle holes in wood blocks made slightly longer than the width of the trap. We also put fat wheels on the 4 X 4's. For low riders, we simply dropped the body down lower and they turned out really cool. I wish I had photos, but in pre-digital days that was more difficult to accomplish. When I first approached that Principal about buying enough mouse traps and screw eyes, he never even hesitated. When we completed our cars and trucks, it made for a great display outside the front office. I ran across the poster for the display when I retired from my last job, but couldn't see any good reason to continue keeping it. Now I wish I had because it was very cool. I had drawn a reclining cartoon mouse on top of a car with motion lines making it look as if it was zipping around. Back then it was all the rage for science teachers to try and get these to travel as far as possible. Some people even used old 33 LP's as back wheels. Theirs looked a lot like out of proportion dragsters. Cars were run on the gym floor and you were really special if you managed to go the entire length of the basketball court. It makes for a good lesson on friction, energy, conservation, ratios, etc..., but I was more interested in making them look cool. On our student made cars, we used baling wire for a roll bar look which really doubled as the feature that lengthened and slowed down the fishing line and extended how far the cars would travel. If the car runs out of fishing line, it stops since I haven't devised a way to allow it to coast yet. Maybe a ratchet type gear would work. ***UPDATE*** 11-2-15 How exciting is this? A 6th grader is the first to get into the spirit of making a mouse trap car by asking his folks if they can get a trap for him to bring to wood shop. This is beginning to feel a little like an episode of Overhaulin'. 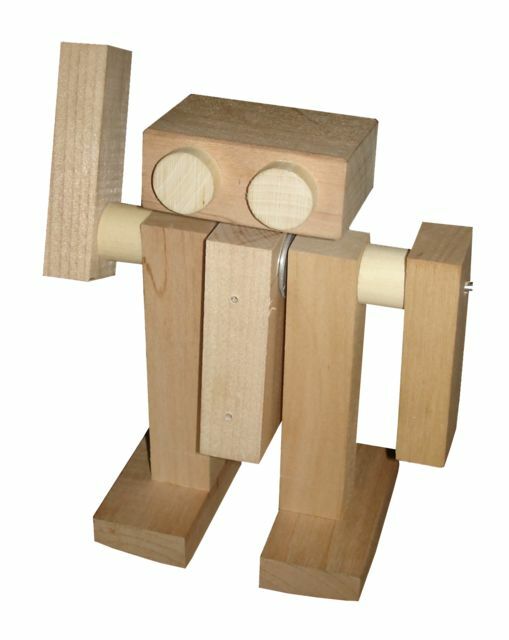 To save on hardware, the 1/4" dowel axle goes through wooden blocks. When the car is complete, it is bound to get other students excited too. To stretch out the riding time, the string is doubled over giving it twice the travel. A roll bar... made from hanger wire... has been added which increases the length of the Omniflex high strength fishing line which in turn, makes the car go further. Larger wheels also add to the length of the ride and if we wanted to really get it to go further, we could cut the back axle and add a short piece of smaller diameter hanger wire which would allow for more winding up of the line. 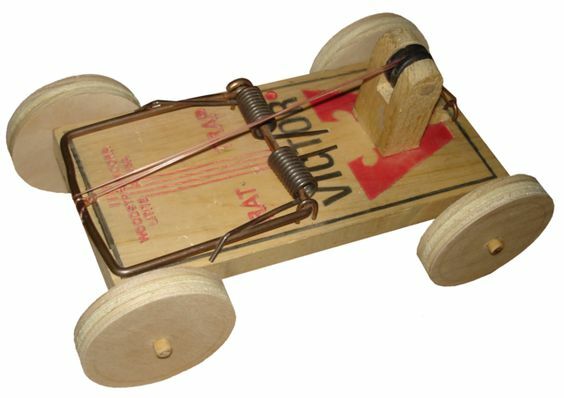 As in real life transportation, each of these modifications gobbles up power and torque, so with the smaller mouse trap like this, we don't want to go overboard and make it completely inoperable, but a rat trap... well that's a whole different ball game. So next time you see a mouse in need of a ride, send them our way. We'll fix them right up. Bad credit... no credit... bankruptcy... No Problem! Payment plans available. Se Habla Espanol! More projects from the past... 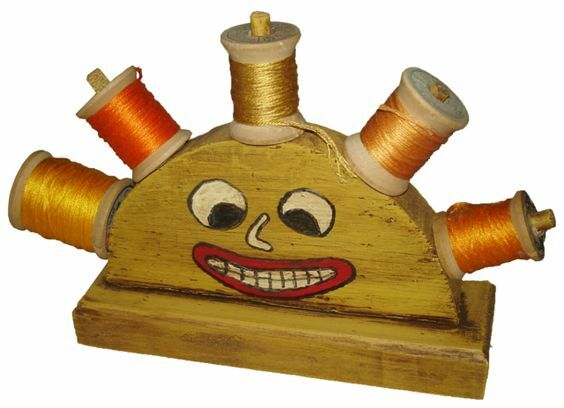 I don't remember how far back some of these folk art projects go, but this (antiqued) thread holder can even be switched into a pencil holder by taking off the dowels. A fine sharpie was used to outline the facial features. Besides using an faux antiquing compound, I've found that walnut colored danish oil over the final paint leaves a faux aged patina, especially where edges may be sanded through creating that worn look. I don't remember where I got the idea for this project, but it gets a lot of attention from sewing and quilting enthusiasts.... of which my wife is one. 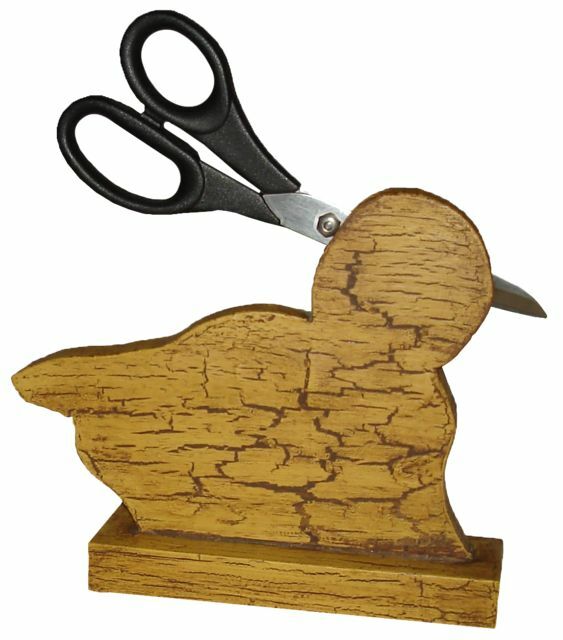 This scissors holder also brings a lot of attention from the sewing and quilting crowd. Crackle finishes like this can be accomplished by spreading hide glue over a lighter or darker paint, then letting it dry, before painting a 2nd coat with a different shade or color. Of course you can buy specially made crackle compound which may simply be a hide glue mixture in disguise. When painting over hide glue, it's best to try to make it cover with one stroke. Going back and brushing over too much loosens the glue layer and pushes it around on the surface minimizing crackle and gumming up the surface. However, that can actually be another trick for your students to try. Slide 44 on page 1 shows the Hello sign where the paint was purposely over brushed making the hide glue slide off into clumps creating faux rust spots. Both techniques are effective in that faux aged look. 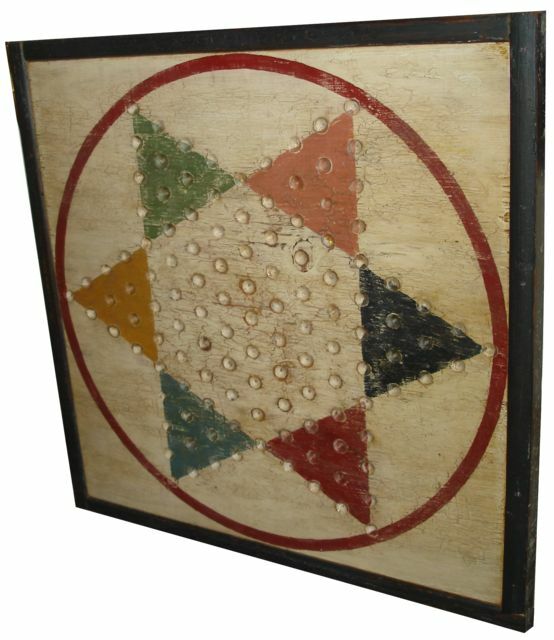 If you can find a genuine antique game board that looks like this reproduction, the price would shock you. Don't believe me?.... Google antique game boards sometime. Believe it or not, students find these appealing and want to make them, but they don't usually want to antique them like this example. On this particular game board, I was lucky enough to score some inch thick wide pine planks. There was enough material to make several other game boards, including a few extra Chinese checker boards that I gave as gifts. To make the marble pattern template, I plotted out the coordinates onto a piece 1/4" masonite that was cut the same size as the game board, then drilled 1/8" holes at each intersection so a nail can go through to mark the game boards. 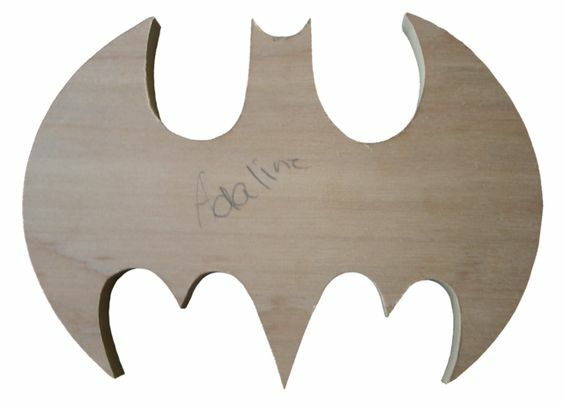 The template is clamped to a blank board and a nail it tapped lightly, just enough to leave a mark. A 1/2" drill is drilled lengthwise through a block which gets cut to length allowing the drill to protrude out just far enough to make the marble divot, then carefully placed at each mark and drilled until the block stops the feed, however, veneered MDF tends to chip out around the holes and doesn't make the best final surface. I'm toying with the idea that a countersink might do the job with a lot less chip out. 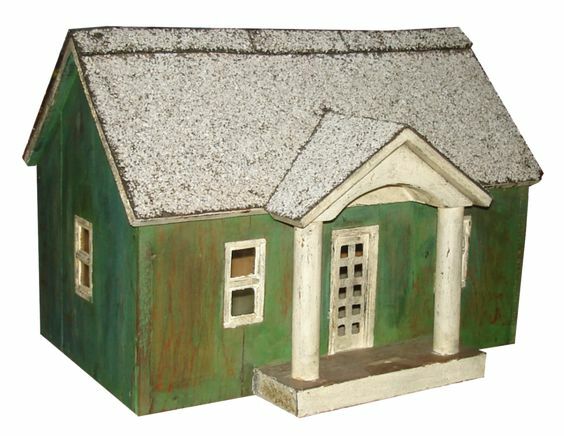 Just like the game boards, if you can find genuine folk art houses, be ready to pay dearly for them. 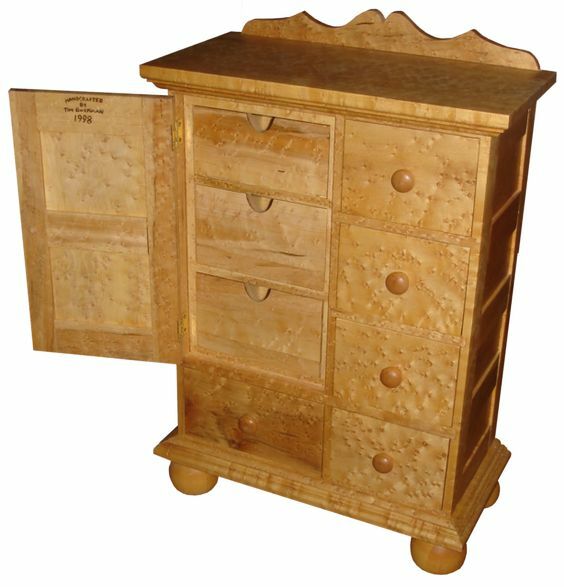 This particular example is one of my favorites that was made from old discarded antique wooden drawer parts. My wife loves them so we have a whole neighborhood including a church. 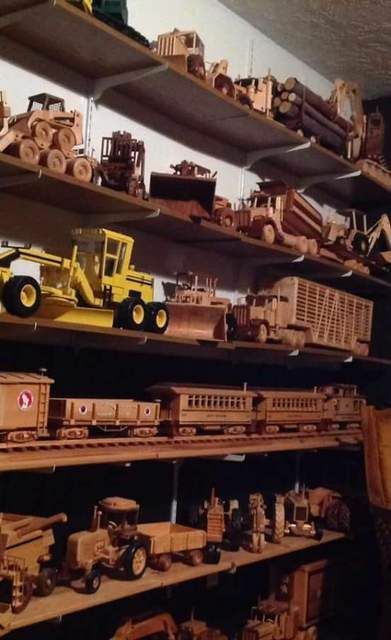 Many in the collection are much more detailed with things like clapboard siding, wooden shingles, and raised panel doors, and sometimes gingerbread which definitely makes them more of a project for high school students. Another faux tip... use copper sulfate (those bluish green crystals found at the hardware store which in solution, kills roots in your drain) to age galvanized sheet metal and zinc coated hinges, etc... Sheet metal can be used for a roof. Line these up across a fireplace mantle and your antique collecting friends won't believe they aren't originals. Now it has never been my intention to fool antique dealers, but I have had them swear I was making it up when questioned about some (not all) of my furniture and folk art. The best part of these projects is how simple they can be to make, and yes, there is real antique glass behind every window in that house, something you probably won't find in a genuine one since many doubled as birdhouses. 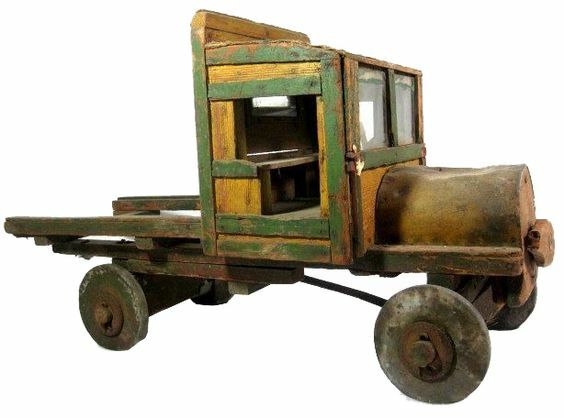 Here is something I haven't made yet but would like to... a folk art toy truck. 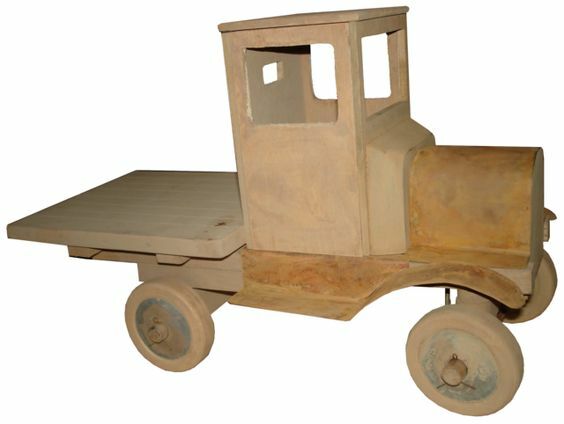 Cars and trucks have always been popular with boys. 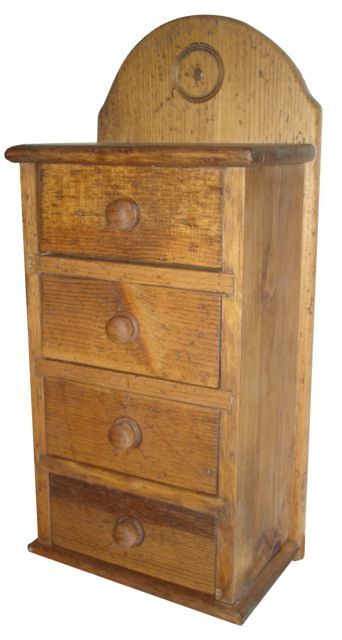 I found this pricey ($499.00) genuine 1920's example on-line. Too bad the dump bed is missing, but oddly enough the wheels are completely intact. Since I want to make something similar, why not try and make it a crossover class project prototype? (I use the term crossover with the idea that this may be a better fit for high school.) I'm always saying, if I'm not having fun, they aren't having fun. This next photo is a view from below and helps to start making the wheels and chassis. The description says this example is 32" long and 12" wide. Mine might end up being half that size. I really believe there are some 8th graders that may have enough skills for (and would want to make) this project, but I'm not sure they would want to put the details I'm adding, or rough it up, age it and antique it like I'm doing. Will it be too complicated? Here's where the rubber hits the road (pun intended). The wheels I made today (8-13-15) are sandwiched between two fender washers that were formed into a slightly domed shape using a hand made form press that was made to fit our large drill press. This makes the process simple and repeatable. 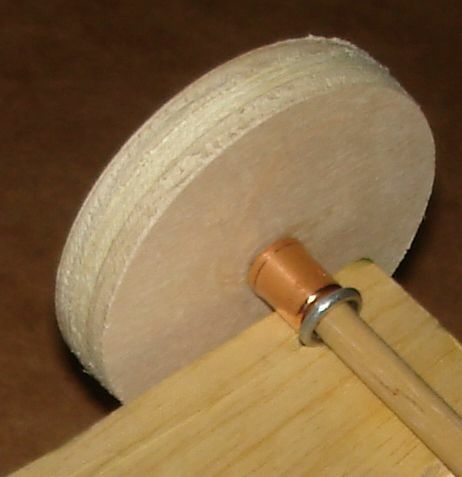 The wood wheel is hard maple first cut with a hole saw, then spun on the lathe to create a depression for the washers and to re-drill the 1/2" axle hole. The exposed wood takes the shape of a rubber tire and the final result thankfully resembles antique toy wheels I've seen which is the retro look I'm trying to achieve. If I had the change one thing on them, it would be to slim them down a little further to better resemble real antique wheels. The wheels fit on a wooden split axle with each half made to pivot. The 1/2" axle is turned on the lathe prior to cutting it to length, and test fitted to the wheels. The final rounded shape is made so it doesn't interfere with anything as it is being actuated as the wheels are turned. 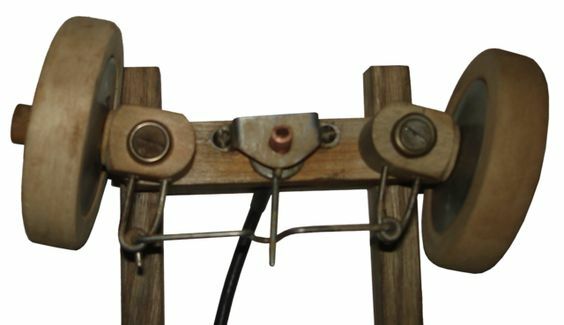 A tie rod made from a wire hanger keeps both halves aligned when they pivot as an eventual steering wheel will be added to turn them. The blip bend (not sure what else to call it) allows for adjusting the alignment and is also the contact point for the steering mechanism at the base of the steering column which has already changed since posting this photo. The blip bend I'm trying out now goes the other direction, is much longer, contains a 90 degree bend and a safety pin like loop where the steering is suppose to attach. It's the best way I've found (so far) to properly support the steering column while keeping everything secure and easy to turn back and forth. Another change I've made since posting this photo is the drilled cotter pin holes to keep the wheels on the axles. I'm not sure if cotter pins will change color when treated with copper sulfate, so if I distress and age my example, I may have to rust them and if that isn't possible, as a last resort, I'll have to paint them rust colored. One of my son-in-laws is into model railroading and was showing me ways to age things simply using a variety of paints. It looks very convincing too, but can easily be scratched off over time. The bent wire on each half axle (with a safety pin like loop) provides a stable and secure attachment location for the tie rod. The students don't know that they have been helping me to test the design for weak points everyday as they come over to play with it before and after class. Every time something gives way, or binds up, the parts are redesigned for a stronger more stable shape and free flowing secure configuration. For example, the safety pin loop idea came from their testing when a single (screw eye shaped) wire going into the axle allowed the tie rod to slowly slip loose. The steering column (not shown) has also undergone several changes. When it works well it's time for another testing regiment by the students. More changes are bound to happen as we go along. I would have used hickory on the undercarriage for strength but ended up using oak since it is so much easier to find in the cabinet shop scraps. Even though I think it would hold my weight, I'm not sure I would actually want to test standing on it like I did with the sub-floors of our residential construction models we made at my last job. The kids are already getting excited and I easily draw crowds on my way across campus. So many of them want to start making one right now, but most of them are far from (in fact may never be) ready. Like I've said before, they think they can do anything even when they are in the 4th grade. I'm not saying that's necessarily a bad thing. It's actually a great carrot to motivate, but this complicated project has already taken more time to develop than any other project I've made up for them so far. Here is a peek at the first body parts. Like I said before, it's bound to go through several changes. It's currently being modeled after the Universal Studios "O Brother" truck (pane 80). Patterns fashioned from manila folder were test fit before actually tracing and cutting the sheet steel (non-galvanized). The surface is guaranteed to rust simply by being in the wood shop under the swamp cooler but I found a way to accelerate the aging starting with a sulfuric acid wash. Brush on a little water and it begins to look great. If I don't paint it, it will have the aged look I'm really into. I haven't decided if I should even paint it and what colors if I do.... red or black.... or black with red (or green) wheels maybe. Black was the original color for cars of this type back in the day and would be more authentic, but red would really catch your eye. I was originally going to use real antique lumber, but decided to sticking with easily accessible 1/4" and 1/2" sheet scraps so the students see the same materials they are currently using on projects. When the prototype is complete, the students will find out how much they helped in the design process. If you're wondering why I wouldn't want the students to know that they are testing this for me right now.... it is because I'm looking for normal wear and tear, and not intentional breakage. 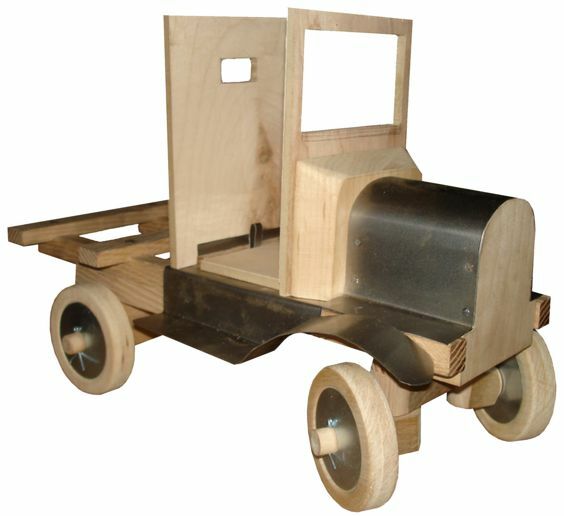 As I trouble shoot this build, other projects are starting to come to mind such as making the mouse trap car wheels capable of being turned so the car can go in a circle, or even using this wheel design to make small wagons, scooters and wheel barrows which I am confident would get attention and be fun to make. I'm ending my 2nd week of working through this build. I haven't been in a rush to finish but rather choosing to take my time and solve the major issues along the way. Steering has become a little more complicated by the engine compartment moving the cab back 3 ", or just enough to affect the geometry of the mechanical link from the steering wheel to the tie rod. This was less of a problem on the test piece since the steering column was right above the tie rod. Another issue is the variable length that the actuating lever needed so it wouldn't bind. There are several ways to compensate for the changes to the steering geometry, but none of them simple (such as rack & pinion, chain & sprocket, or cable). For my model I have chosen to try testing a cable. There would be more than one way to run a cable, (for example with pulleys) but for this test, mine runs straight up through the front axle and will go through the engine compartment and firewall. The cable ends inside short pieces of copper tubing. The lower copper tubing has two holes through it (hard to see from this angle) to keep the lever stable. A custom bracket holds it firmly in place. The cable has already changed to a flexible speedometer wire encased in (water drip system) black tubing and when the cable gets twisted, the lever easily turns the wheels. The cable does a perfect job and it has turned out to be a great solution so I drilled an access hole through the firewall and attached the steering column and wheel (made from a fender washer and some copper tubing). I cut off the extra cable, filled the copper tubing with clear silicone and tested it after drying 24 hours. It turns the front wheels when actuated. Even though I have no money in it yet, I'm not sure I could come up with enough cable to make more. In other words, this type of steering is not a great option at this school given our low budget concerns, but it has made the build more fun for me. 8-24-15 Assembly can't begin until the chassis aging is complete. Replacing all the newer Phillips head screws with older slot screws gives an authentic retro look that I like. I treated the fender washers on the wheels, the cable steering bracket, tie rods, and the cotter pins, with sulfuric acid (take all proper precautions as it will bubble, boil and throw off vapors immediately upon dipping it into the acid). This removes the zinc so they can rust. (This can also be done with hydrogen peroxide, vinegar and salt although I haven't tried that recipe yet.) After placing the steering bracket and cotter pins into a shallow water bath I left it to evaporate. I brushed the wooden undercarriage and tie rods with what was left of the used acid (which works on some woods, but didn't seem to do a thing to oak unless there was metal on it), then rubbed my fingers with charcoal from our barbecue grill and rubbed and sprinkled it all over the wood. After washing that off, I went out behind the house and dug into the rust colored clay soil, added water to make a watery paste and also rubbed that all over the wooden parts and wheels... really piling it on so it would stick into cracks and corners and then left it out in the full sun to dry. It really looks as if it's been outside a long time. The photo doesn't show the first metal rusting and unwashed coating of ash and dirt very well. Sometimes the flash will change the surface appearance (color) and that is the case here. Even though I've done this many times before, I don't have a set procedure because you simply do not want every single item to all look the same. To avoid that factory look, you want everything to appear as an individual piece. I'm thinking I can lightly wash and sand the dry parts concentrating in areas that would actually get worn with use. If you hit every corner, it looks contrived. Then I may (haven't decided yet) experiment with a patina (walnut colored oil) over worn areas first. The beds stake sides are coming together nicely. There are (non-working) head lights and a front grill made from old window screen, and I've changed the cab style from having closed sides to one with open sides and a bench seat. Open delivery style sides solves many issues that I am running out of time to solve, such as hinged doors. It is way easier to reach and actuate the steering now. I still have the other sides which I really like, but as much as I would like to keep tinkering with them, I have to complete assembly and move on to other issues. 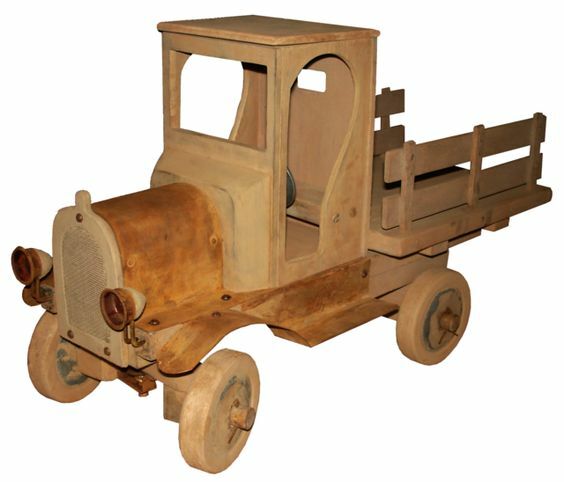 I've slightly adjusted the brightness and contrast to try to capture the actual look of the wooden hand made folk art toy truck. It didn't quite work as the whole truck looks a little too rust colored and less dirty. The flash is simply wiping out the true colors. In reality the rusted metal and the dirt covered wood look close in color, but not quite this rusty. The stake bed sides tightly protrude right through carefully scroll sawn square holes in the bed. I still need to make the stake section for behind the cab and for the tailgate. The headlights are those brass coated finger pull cups for sliding cabinet doors. I simply gave them an overnight acid bath to eat away the entire brass coating, then made wooden pieces on the lathe to give it the final acorn shape. I was considering remaking the headlights and placing old fashion round style light bulbs wired to a hidden battery under the bed, but not sure that is really going to happen. A simple U shaped and bent wire bracket drilled directly into the front of the chassis frame holds them steady. You may ask... "Why would you go to this much effort to solve the many issues that you have come across on this silly project?" Well the first thing that comes to mind is that it isn't silly to me or the kids. It activates the students brain to the possibilities.... to see how problems can be solved and how they too can increase their experience and skill level to eventually do projects like these. They think this is totally cool. Many students come by each morning to see the progress. Next reason, it's so much fun of course. This may be the best part of my job, figuring out how to do all these cool things for the kids. Coming up with ideas, making the jigs and getting them excited about learning and helping them to make it happen. It is so much easier to make it fun than to have discipline issues. When I was in middle school back in the good old days when it was still known as Jr. High, one of my teachers challenged the class to build a model of the Edison phonograph. As much as I wanted to do it, my father was an academic subject teacher and didn't seem very mechanically inclined. He was always busy.... trying to provide for a large family. I (on the other hand) happened to be a pretty independent thinker. I was the kind of kid that tore stuff apart to see what made it work. We didn't have access to many tools. I had to find my own materials, usually rescuing things from the trash. Come to think of it, it was the perfect setup for what I'm doing today. Anyway I struggled to make that darned model phonograph and a friend of mine had access to all the things I couldn't get like help and support from dad, tools, materials, etc... His model had threaded rods to track the needle. I was mesmerized by the possibilities and even though I had solved some of the issues that he couldn't solve, I eventually went on to concede defeat. I really wanted to make my own version of Edison's invention. I wanted to actually hear my own voice come out of those little lines on the foil. I didn't like giving up then and I don't like to give up now. I have the front windshield and back windows installed and they look fantastic. The wavy glass comes from some 1920's window sashes (still in the frame) picked up 20 years ago at a yard sale for 25 cents each. While the older glass is brittle, it still cuts straight. Some 1/4" drip line sliced open with a utility knife makes the gasket for around the glass on the front windshield. Since space on the back window was at a premium, baling wire inserts both inside and outside keep it framed and in place. The other stake bed parts are nearly complete and now I'm in a quandary about whether or not to complete the cab assembly. If the cab is finalized, it will pretty much cut off access and dis-assembly... in other words any chance for students to be able to look at unseen parts of the build. I can still however begin adding wear patterns as well as add black dirty build up, especially around the door frames and other places a child's hands would constantly be in contact with any surfaces. The best way to be able to tell exactly where that is would be to watch the kids interact with the toy and that is going to take a little time to accomplish, especially with the top (cab roof) left loose. I already have some students chomping at the bit to start one of these so it has definitely become a carrot. I remind them I won't let them begin until they can prove they have enough skills. 9-16-15 One of the former students from my days as a high school teacher back in the 90's (but was not in my wood shop classes) now works as a teacher at Franklin Phonetic School. She was telling me about another former student who was visiting her uncle, and saw these shelves of cars and trucks. There is a much cuter story on Facebook, but since I'm not on facebook I'm sure I would retell it all wrong. Here is the short version... he made them all. They are not aged... and WOW... completely blows mine away. Another project from the past. 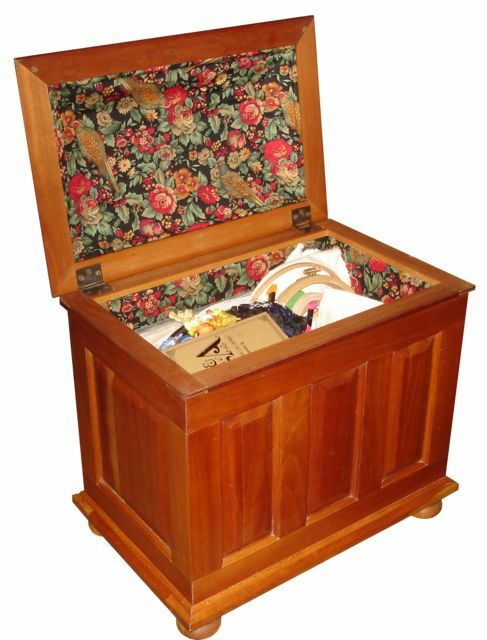 Sewing casket is an old fashioned term for a large sewing box. 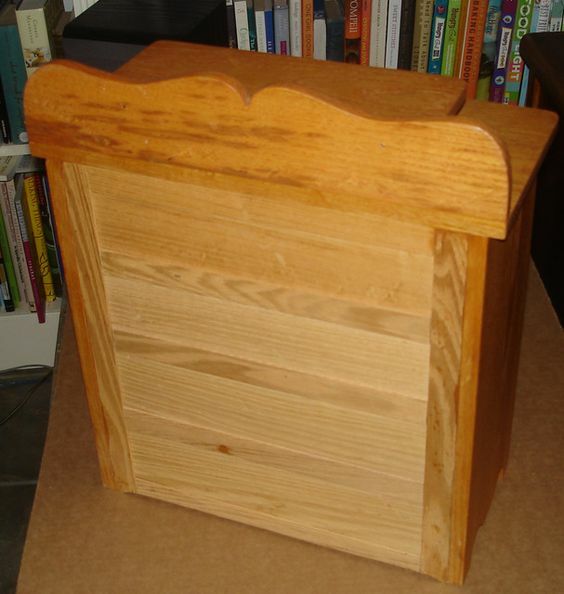 Made for my wife, from discarded cherry cabinet doors, this was made to resemble an actual casket both inside and out. I would take it to school at the start of a new year to inspire my high school students to do similar projects. The cherry doors (given to me by Craftsman Woodworking, now MCK Woodworks) were disassembled and the raised panels were remade smaller with an old fashioned look of a hand tooled bevel. The frames were also altered to go back together forming the box. An arched shaped cardboard liner was made to fit the inside of the top and then covered with quilt batting first followed by fabric. 1/4" fabric covered panels line the interior. 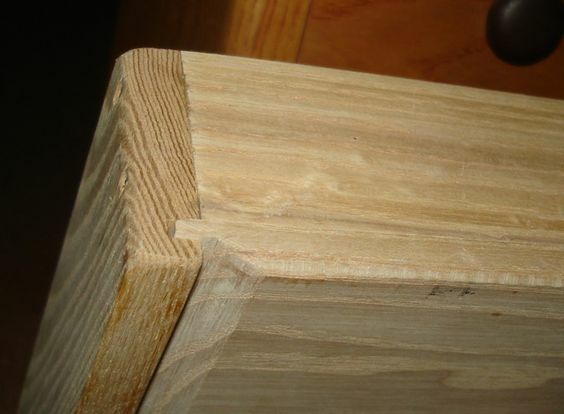 Open mortise and tenons keep the corners from coming apart. The choice of size for all these small projects makes sense for a number of reasons. First, they are easy to transport back and forth to school each year, then they take very little material making them inexpensive. It provides motivation because they are so cool and they require a great deal of skill to complete, which really helps provide in class teachable moments. Continuing with the theme of projects from the past... this is the first year project (developed for beginning high school students) and was made by one of my daughters in 1997 for her grandmother. The project was designed to use every piece of shop equipment we had at the time. Many parents had a difficult time believing that their son/daughter made this from scratch. 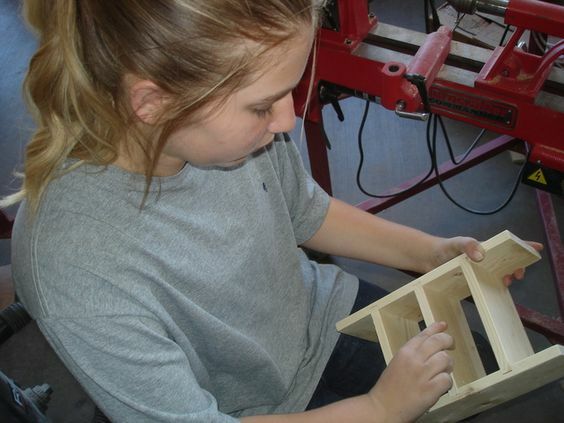 The middle school wood projects from the feeder programs at the time were making CO2 cars. I encouraged all of my students to customize their roll top with a variety of decorative effects and secret compartments. 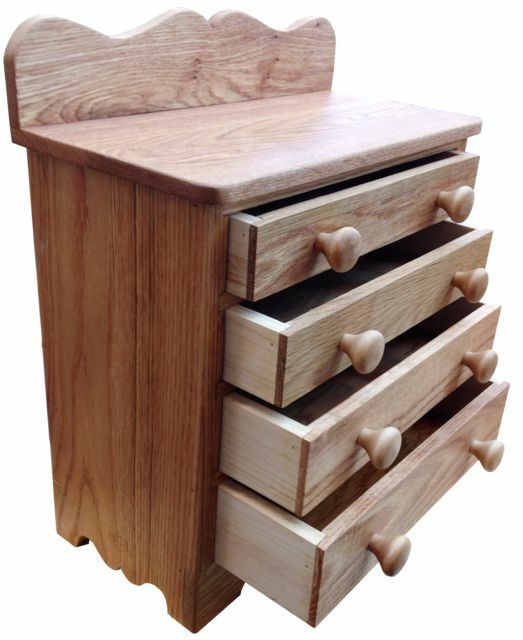 False drawer bottoms, hinged flip open (video clip) top and tray, hidden drawers, double drawers and more. This particular one has a hidden drawer behind the spacer above the tambour. I created a whole system of jigs for rounding the fronts of tambour pieces, routing the tambour grooves, holding the false back in place, making false drawer fronts, etc... The students had fun and really got into it. I keep this one at school now to show my middle school students what first year high school wood shop used to be around here. After completing the roll top project, the students had to design their own project. I encouraged at least drawers and or doors. This is what my daughter did as her third project that year. Later classes were able to incorporate the laser engraver... more on that coming soon. 10 years later (2007) one of my students snapped this photo where I used that spice drawer project (seen drawn on the front board) when I was going over how to plan a project. American woodworker magazine used it when they featured my program that year. Read the article. 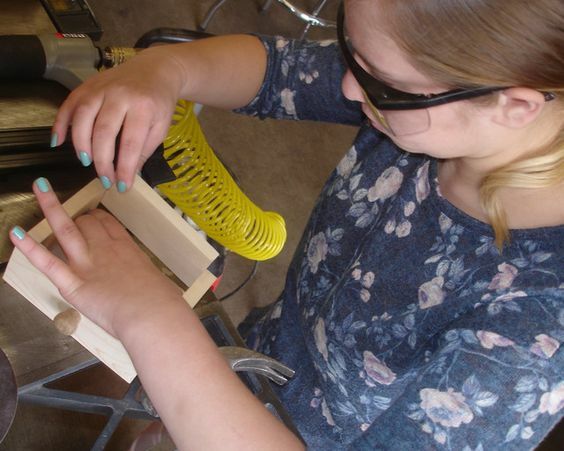 One of my daughters college summers was spent running the wood shop for (YEI) Yavapai Exceptional Industries, a charitable organization supporting adults with disabilities. She later went on to teach science and is also an accomplished weaver and a terrific mother. ***Update*** 8-13-15 One of my 8th grade students wants to take this project on... but I told her that the main cutting will have to be completed by me. I showed her how to break it down into a materials list today and she started selecting the materials. Two weeks later, After a few false starts, we have a case far enough along that she can see the main shape and structure. The back and drawers will be next. Was this a 9th grade class? How long did each project take? Thanks! And again, nicely done! Thanks... My beginning classes were one semester, and mostly filled with 9th graders like my daughter at the time, but the class was also mixed.... not limited to 9th grade. There could be 10th, 11th, & 12th graders too. 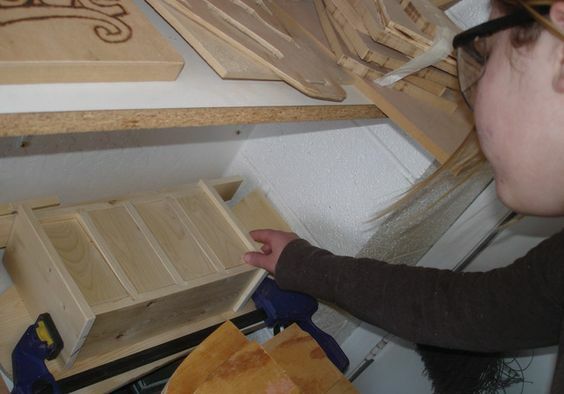 My daughter completed 3 projects that semester (2 roll tops, one for her, one for grandma, and the spice drawer) but as a straight A honor student, she was never able to fit anymore wood shop classes into her schedule again. During a semester, some students barely finished one roll top, but most completed at least two projects. A few completed more. To keep the costs down, each roll top took less than 4 board feet of pine. The (video clip) gives a sense of the size... the drawer front for example is 2" x 10" and the top is 3 3/4" x 12". Like you, I had to stop charging my $8.00 shop fee so I looked for ways to lower shop expenses. As I process more photos, I will soon be posting a few more affordable high school project ideas, some that were for the more advanced students.... that I think you will probably like. Talk about projects from the past... I found this plaque being thrown away at one of my college jobs nearly 40 years ago. I'm not sure exactly why I kept it all these years, except it was cool and could hang quietly on the wall out of harms way, but at the time I found it, I remember thinking about how much woodworking had changed and might further change during my lifetime. What is the chance of being able to get my hands on one of these lasers? Just look what technology has done in only a few generations. Woodworking changed very little over thousands of years, but a hundred years ago we saw big changes with power tools, then cordless tools, and then computers. Back when I found this plaque, we were still using punch card technology to register for classes. I used to ask my students to consider what they may see in their lifetime. I got to witness the evolution of hand held devices starting with the calculator. As much power in your hands as a room sized computer from only a few years earlier. 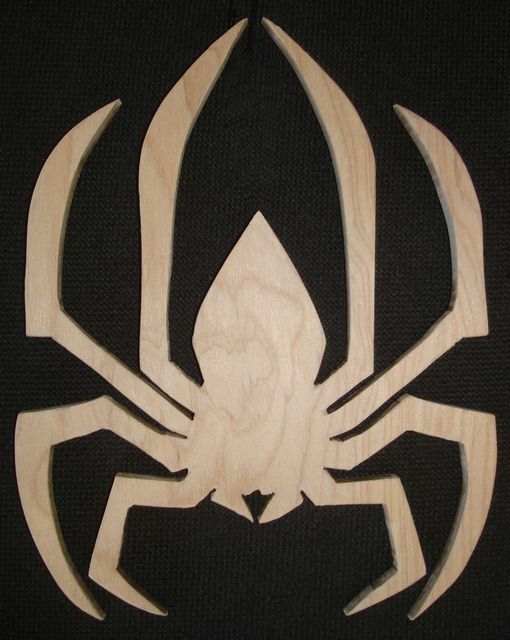 Maybe, just maybe we will use lasers in woodworking someday.... perhaps a laser table saw (no blade, just light). 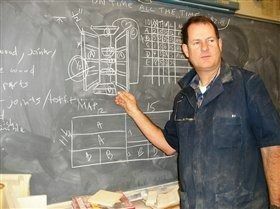 If you use my curriculum, you can see how I like to walk students through the historical aspects of woodworking technology. What made me push my last school into getting a laser engraver when I first saw one? After all, the price wasn't exactly cheap. It was a state standard they thrust on us about students learning to use CNC. If the state hadn't backed that up with funding, it would not have ever happened in my shop. I've heard a few wood shop teachers discuss their disdain for CNC. I'm not one of them. If everyone thought like that, we may have never have gotten past the stone age. To me, this new technology is exciting and I couldn't wait to begin exploring it. 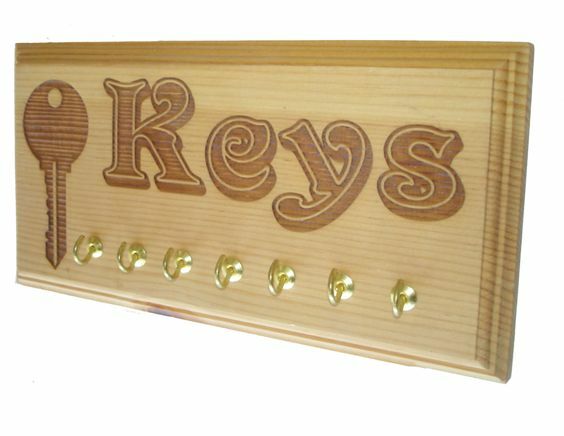 In minutes, you can take an ordinary piece of scrap wood and turn it into something of value. Accurate, detailed, repeatable, and just plain cool! 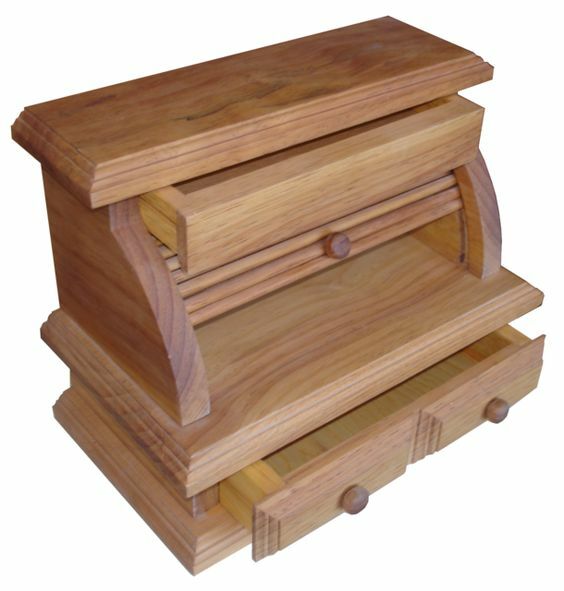 Here is one of my first project prototypes, made from scrap wood given to me by then Craftsman woodworking, later to become MCK woodworking. 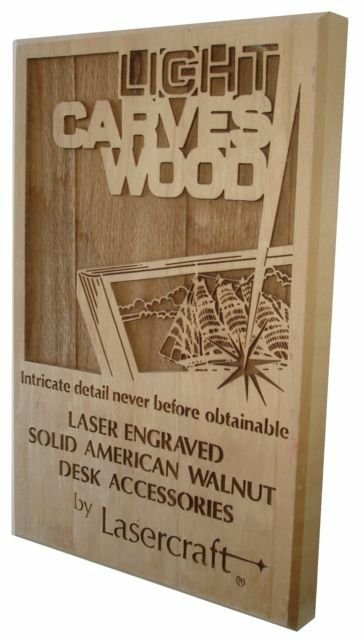 I wish the technology wasn't so expensive because I would love to have a laser engraver for the Franklin wood shop. We used to engrave names on our pens. I am posting videos about setting up and using the laser engraver. It literally changed the look of the roll top project just a couple of panels up from here and also showed wood shop students just how much spelling does matter. Please note... I'm sorry, photobucket has cut off all the video links. Maybe you've gotten tired of looking at old project ideas from the past, that I used to inspire my high school classes, but there's still a few choice ones that I believe you might like and there is still a few days before my students show up, so I have a little time left to show a few more. I had a chance one time to work a few trades with an antique dealer and picked up a full sized dresser that had a horribly dark finish on it. This was before antiques road show was on the air where people regularly find out they have damaged a pieces value by refinishing it, so not knowing any better, I decided it was one of those finishes that looked as if it were layer upon layer of dark finish that needed to be removed, so I proceeded to strip it clean. What I found hiding underneath was a gorgeous piece. Not fancy, but rather a homemade primitive of the best kind. Let me put it this way, if that finish had remained, the piece would have been traded off a long time ago and I never would have seen any value in it. 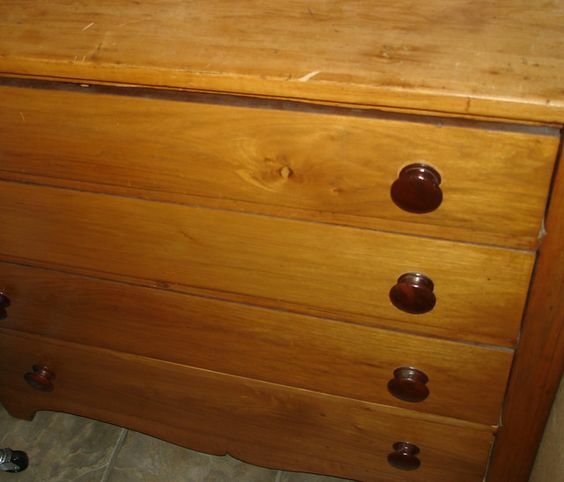 What I found was a light, almost maple colored walnut grain with dark walnut knobs that are actually threading into the drawer faces but not going all the way through the drawer front. What a difference. 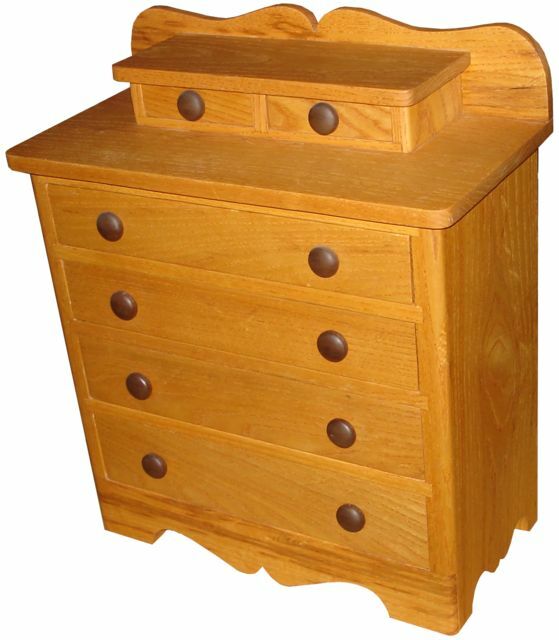 Despite becoming one of our favorites, the dresser isn't in a great location making photos difficult. My wife actually uses it for art supplies, but this awkward view shows the color and knobs. I simply used paste wax to protect the surface. Isanti is derived from a Sioux name meaning "knife". I looked at maps and noticed only one small dot indicating a town or collection of buildings named on the map like a town in that entire area, so it is from a very rural location that appears to have remained somewhat rural. I scaled it out in miniature and made a prototype that stands about 17" tall and 15" wide. I showed that to my then students and it quickly became a favorite project which I ended up bringing to class at the start of every school year from then on. 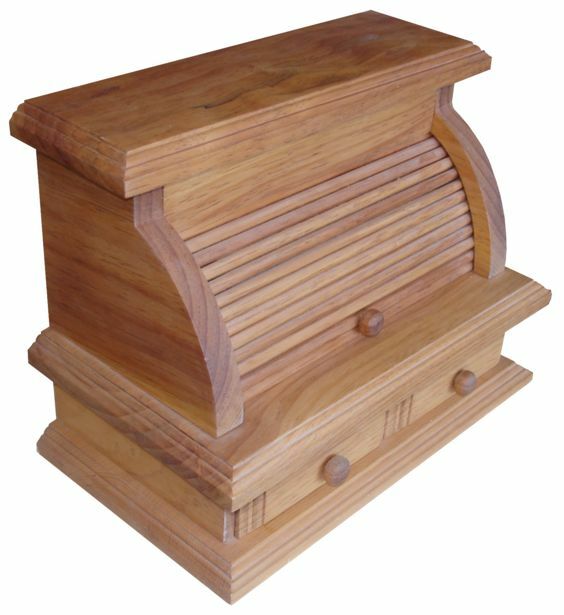 Made from golden oak, with dark walnut knobs, this is an easy project that helps even the most reluctant learners to have a successful outcome. It's also the piece with a great back story that makes me remember to tell students to sign and date all of their work. ***UPDATE*** There has been enough interest in this project that I'm posting additional information. Since DivShare has pooped out... I'm sorry if you haven't been able to download templates and other information I have posted through out these pages. I believe that since I can no longer sign in to my uploaded materials.... DivShare may be holding information (from their free users) hostage until free users agree to purchase their yearly data plan, so I'm going to start posting items directly to here. Dimensions- all material is planed to 1/2" except for the sides. ***UPDATE*** 7-15-17... Photobucket changed their policy of allowing free 3rd party hosting so these images now come through Pinterest and can not transfer the attributes that give them the transparent backgrounds. 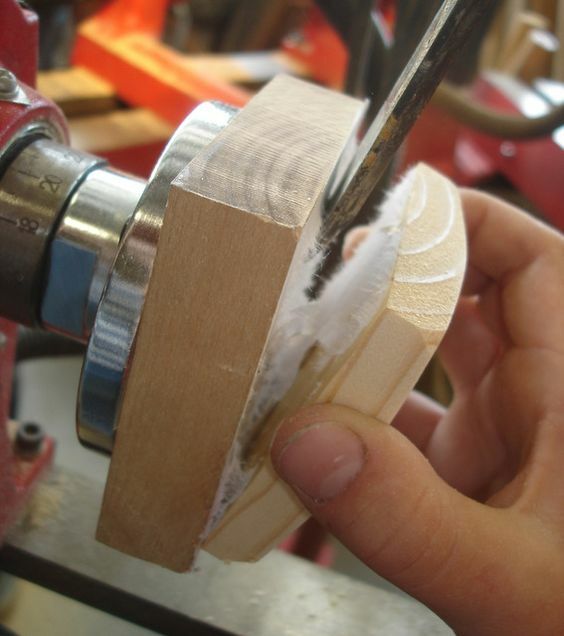 Inside- matching 1/2" dados are cut in mirror image for web frames. Optional dust panels. 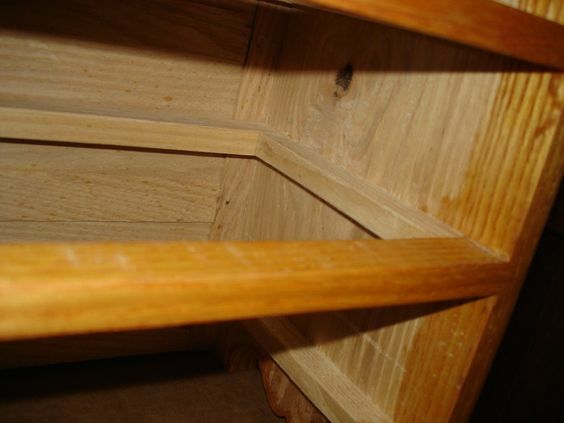 Drawer bottoms - do not have to be solid, or 1/2" thick. Larry Thibault's students saw this project and wanted the challenge. From what information they found here, and some reclaimed materials, they met the challenge with impressive results! I asked if he could send some photos of completed projects. From what he chose to share, I liked the angle of this one the best. I believe from seeing the original photos, it was made by one of his female students and it looks especially good with the entire background removed. This may very well be the last "past" projects to be posted here.... at least for now... because school starts tomorrow and while I don't have to be there on the first day (I'm a part time teacher now) I will go anyway to make sure my flat screen has been installed and that my class lists are ready. Rumor has it that my numbers are up. It's time to get down to business. Before I get too far into that realm, I wanted this project to get posted. It is one of those portable projects I would cart into class for inspiration during our design unit. This Birdseye maple was from a very small pile (almost too small for the project) laying at the back of a now defunct woodworking business. They wanted me to cart away all their scrap which I gladly accepted. Most of it was alder. It's too bad that business didn't survive because it was one of the few that did practically everything with hand tools. Come to think of it, maybe that's partly why they didn't survive. The other reason is having only one customer. Seriously, they had gone into business to supply one business with antique reproductions for staging model homes. 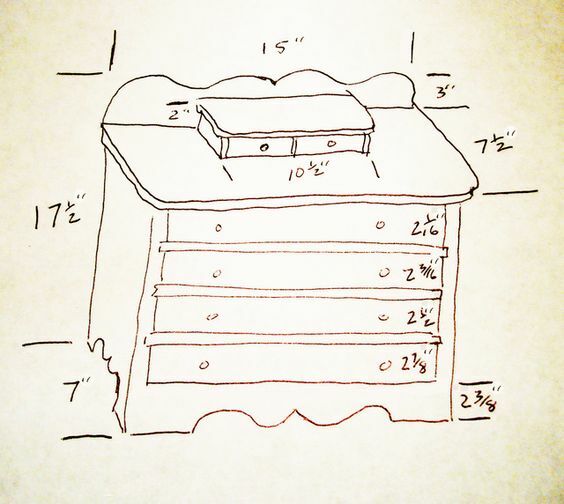 This project has everything you would want for an advanced high school woodworking student... frame and panel... eight drawers... a raised panel door... and measuring 14 1/2" wide x 19 1/2" tall x 7 1/2" deep, all solid wood. Frame and panels were used in order to make that small amount of Birdseye maple stretch far enough for the project. 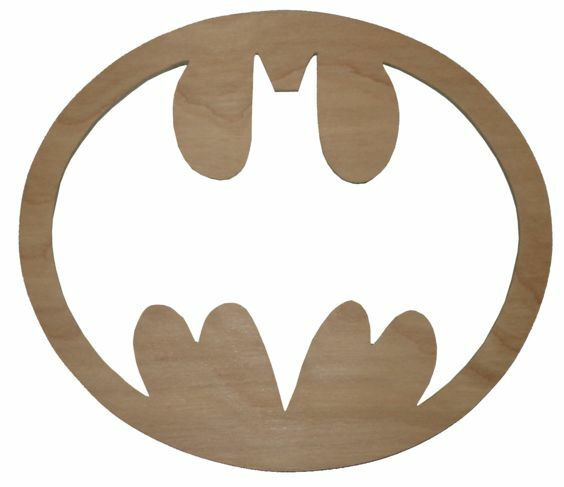 When cut correctly, two frame pieces, or three thin panels could be obtained from a single full thickness solid piece. Secondary woods for the back (which is frame and panel) and drawers (including the drawer bottoms) are solid oak. People are always giving me weird things made from wood and that's certainly the case for this next project. Someone gave me this Do-Nothing Machine years ago and I've always kept it around both schools. 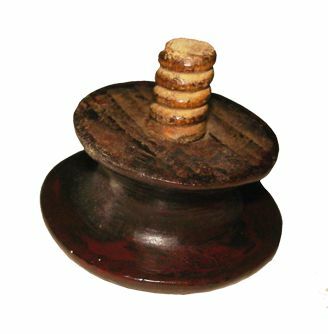 If you've seen one of these, they grind endlessly around and around, but not in a circle... in an oval. As usual the photo is deceiving in that the color looks as if the top has had some kind of finish (like paste wax or oil finish) put on it. If something has been put on the surface, it has only become visible because I've altered the brightness and contrast so you could better see the object. The crank itself is raised above the surface and wouldn't require anything on the surface to make it run smooth. In reality the wood looks uniform in color and dry as a bone. This is actually a cool idea I never would have previously considered for a middle school project. It's been on my shelf here at Franklin Phonetic and several students have commented on it, but I never found the time to get around to doing something more with it.... until now. You see.... a lot of returning students are excited to climb further into woodworking. One of last years 4th grade students is back... obviously now in 5th grade. She has really been a powerhouse producer, making more than one pen and plenty of other projects as well. 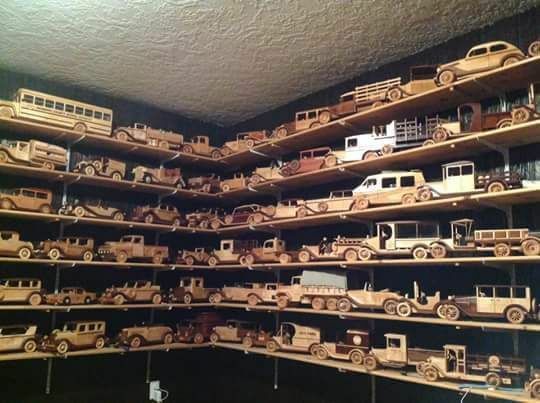 Since she is in a relatively small after school class of returning veteran woodworkers, when she pointed up to the top shelf and asked if she could make one of those, I simply couldn't think of any good reason to say no. 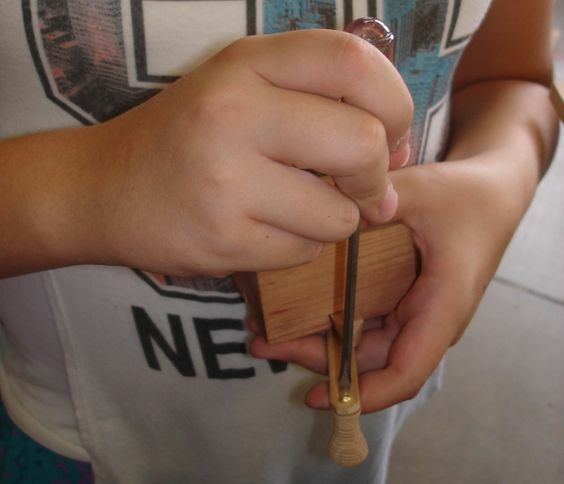 Can you imagine thinking of fifth graders as veteran woodworkers? We started making it today and I'll be documenting our weekly progress along the way. I think it's going to be fun, but now everyone will want to make them so I will have to spend a little money to get a box of those small screws. I guess I can't get everything from a dumpster. I'm also going to have to bring one of my router bit sets from home, at least until I can get a dovetail bit for the school. We now have some screws. 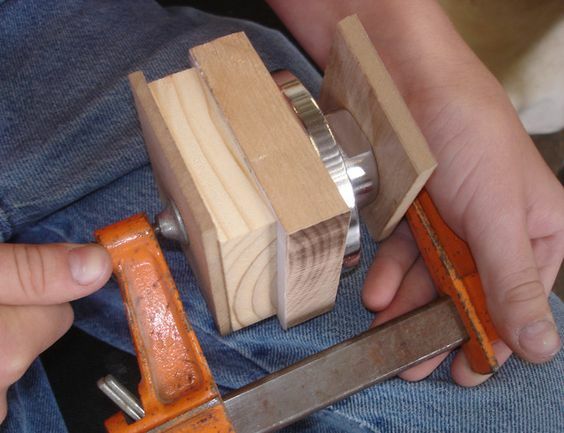 The dovetail router bit from home is in the router table with the height properly adjusted. 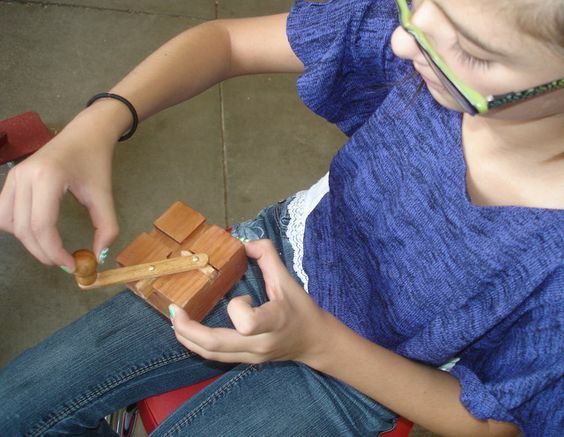 Taking a 5th graders skill level into consideration, some blocks of wood have been cut. They were passed over the table saw to remove a little of the material in a cross pattern prior to routing with the dovetail bit. That made the routing go much easier. 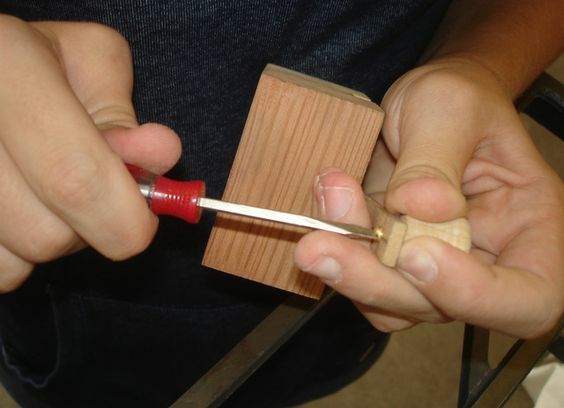 I might have to come up with a routing jig so younger students can succeed in doing their own routing. Blank material has also been cut for the crank and dovetailed pieces. Another 5th grader has joined the fun. Both students cut their dovetail and crank pieces to length. They lined the crank up to the model to mark and drill the holes. The dovetail pieces require some shaping on the sander and need a drilled hole for mounting. 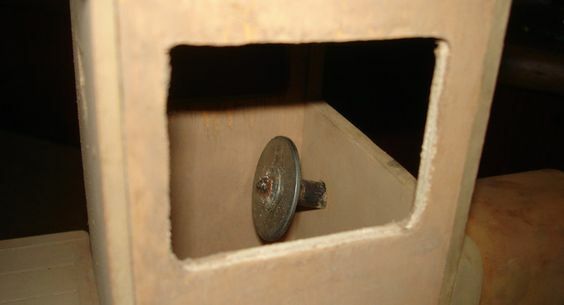 After the students measured and drilled the center holes, the screws were placed and the pieces were attached. At that time they were able to actuate the mechanism and make adjustments for a smooth run of the crank. 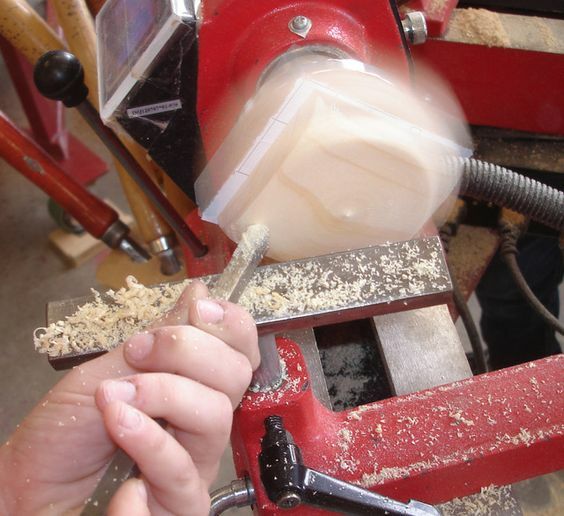 They are already well experienced on the lathe and they used it to make their crank handle. One advantage of being in the after school program... the younger students get to come every week, and sometimes twice or even three times in a week depending on the schedule their parents chose. It is time for adjustments and maybe a little wax to smooth out how well it runs. Looks good to me. ***UPDATE*** 1-6-16 The students are wild about this project, but lately El Nino isn't helping. We are in for several days of rain and this morning... even snow... with a 2 hour school delay. That gives me time to make this post before school. Yesterday's humidity never let up and in fact I had to drive all the way to the school in thick fog. It was so heavy that you could feel it on your face and see it collect on the windshield as you drove. That's not something that happens here very often. When class started, one of the students couldn't figure out why her "Do Nothing" project she started before Christmas would not.... well.... do anything. It wouldn't hardly move when she tried to crank it, but before break, it worked just fine. "What happened?" she asks. I remind her that we have already covered this topic as we have had this same trouble with motion toys like the hoping kangaroo and the walking robot or the waddling duck. These motion toys all rely on pivot points and sliding joints that swell with humidity and slow down... and even seize up. Simply take it apart and re-sand the pieces until they run smoothly again. Now it works! As we share ideas, Larry mentioned having access to steel ball bearings. I of course asked if there might be a way to get some of these from him, even to the point of trading curriculum. He found that his local supplier who had been giving him ball bearings from his business failed to mention they were brand new right out of the box. The generosity of business toward education has always been evident as I go about my teaching, but to offer a teacher new stock (for free) is really a compliment to that business, especially when they never said anything about it until later when you return to either show them some examples of student work, or maybe have your hand out to see if you can get more for another teacher... as in this case. It turns out they are not so expensive and Larry went about getting more information which he shared with me and I have copied and pasted from his e-mail so you might also benefit. MSC #: 00072785 1/2" chrome steel package of 100 $15.12 (Shipping cost?) On Tuesday the price was $12.80 with 219 packages in stock; today the website does not display how many are in stock. I decided to get 500 1/2" chrome steel balls from Craig Ball Sales. The shipping cost more than the product but since I rarely buy anything, the school had no problem purchasing them for me. When the office received a box of chrome steel ball bearings, they were really wondering how I was going to use them in wood shop. In hind sight (especially with the shipping cost) I should have looked into some of a larger diameter too, but after a little trial and error I was able to master making a few of the toys using the small 1/2" size. It didn't go well at first and I thought to myself, the school put out money for this and I can't seem to make it work. My after school assistant asked me if I were going to use them with a wrist rocket.... sling shot! Well, that wasn't the original plan. 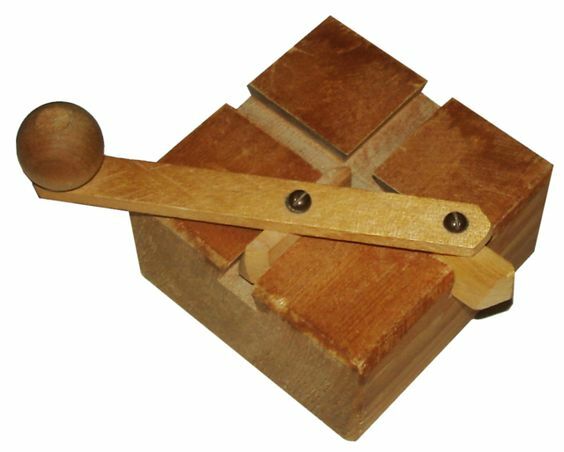 What I discovered was that the smaller toys don't clatter nearly as much, and the wooden case has to be made as light as possible in order for the small 1/2" ball to have enough momentum to flip the toy over and over without too steep of an incline. Less incline makes it look way better as it tumbles slowly down the incline appearing to have a magnetic almost anti-gravity affect. I used some of the free scrap alder (cabinet shop) for the cases and some of the free veneer (artist donation after our cool front page article) for the faces. I also ended up shortening the length choosing to keep it about two balls long which helped to reduce the needed torque. When I found it worked after the third try, I then made up a template knowing that someone else was going to want to try this that day. As each class filed in for roll call, they really went nuts for the first prototype (left). A few of the students said that it reminded them of Mexican jumping beans. One girl even had to tell me the story of how their Mexican jumping beans actually hatched out. It turns out that I'm not the only chatter box around here. No matter.... nuts or beans, some of the student got a start on making theirs yesterday. One 5th grader almost finished (enough that the toy would walk or rather tumble) and started showing it around school. You know what that means...? Everyone will see it before my next class on Tuesday so I wanted to complete a few more samples and have more templates by then. The three sided examples slowly tumble even better and the larger one actually does a bit of a swagger or stop action jitterbuging vibrating motion as it tumbles along giving it quite a bit more animation and character. It's also a much easier shape for the younger students to make and has quickly become their favorite. Although I tried making one of the triangular ones just a little bit larger, it didn't tumble well once I passed the two ball length on the sides so instead I tried one ever so slightly heart shaped, with the inside smoothed out enough to get it over the humps. It works and is really eye catching, but requires about a 1/4" rise to the high end of the incline. 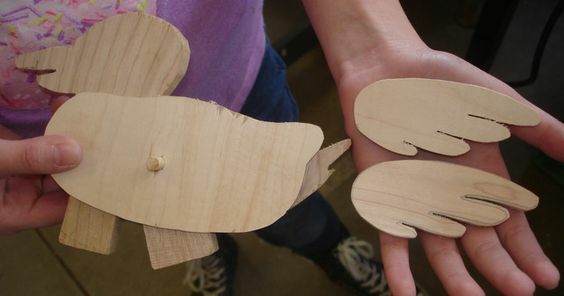 Although this is one project that would easily fit our weird schedule, with the cost after shipping at a little over a dime each, the students really could experiment with making their own shapes. I never counted how many kids I actually see each week, but I'd be willing to bet I have enough with that 500 box for each student to do several if they wanted. Last year this drill press's coil spring snapped. I took it off and gave it to maintenance with his promise that it would be fixed soon, but to date it still isn't working, until I tried using my own spring from home. That spring didn't work very well as it made the movement harder as it got further, and didn't spring back without stretching out of shape. It frequently slipped off the pulley and the chuck sank back to the bottom. You can see the out of shape spring still attached to the machine. I resorted to running picture wire up and over the large drill press to provide a counter weight. I'd like to have done that down behind the drill press and down through the bench, but that required making many more pulleys and the exhaust system is in the way. It's something I might still try to do if time permits. The pulleys are made from the discards that students get when they cut the openings where the ping pong balls store on the ping pong ball shooter. I usually save them for small cars and truck wheels and accumulate more than I can use. It was a simple fix and didn't take long. It works well and doesn't snap back too fast like the spring from home tended to do. The best part about this project is it didn't cost a cent since I had all the junk saved from here and there between the new shop and the old. It's amazing what you can find when you turn the entire place up side down. And since I like figuring things like this out, it's fun too. Where the original coil spring was attached, I cut another size circle with the hole saw and made a groove around it using the lathe. It is drilled out to the shaft size and a piece of sheet metal goes through the hole where the shaft is split for the coil spring. This keeps it from slipping as it spins down and back. The sheet metal also keeps the shaft from collapsing inward when the nut is tightened so the threads won't slip. 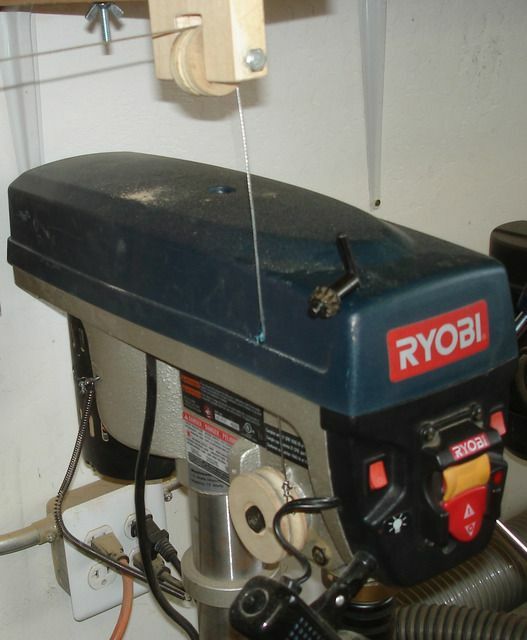 A hole through the top of the drill press is needed to align the wire with the wooden pulley so it winds up correctly. Hey, what ever works when on a shoe string budget.... right? It's a bird.... it's a plane.... it's Superman! ***UPDATE*** Although I didn't watch it, after last nights pilot this can now say SUPERGIRL. A couple of the 6th graders asked yesterday if they could look on Google for something to make in class. Really? There aren't enough project choices already. Ha! I actually didn't say that because I'm glad as 2nd and 3rd year returning wood shop students that they are not only motivated and showing such initiative, but also that they are confident enough in their own woodworking skills to want to try something different and challenging. I of course agreed to let them search and was glad to see them choose and print these off so they could start tracing them out. 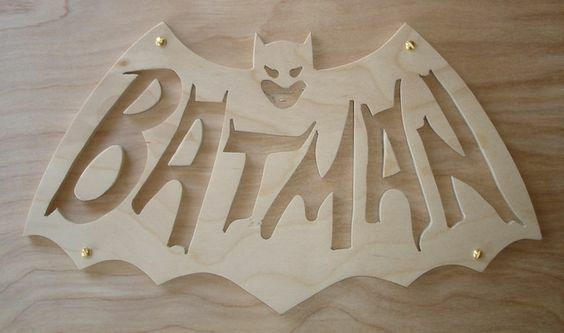 After all, you can never get enough practice on the scroll saw. Oh yeah.... I'm also glad to have the new 1/4" thick templates for our collection. In fact... you could say they are super...... man. This one wasn't ready in time for the first posting. 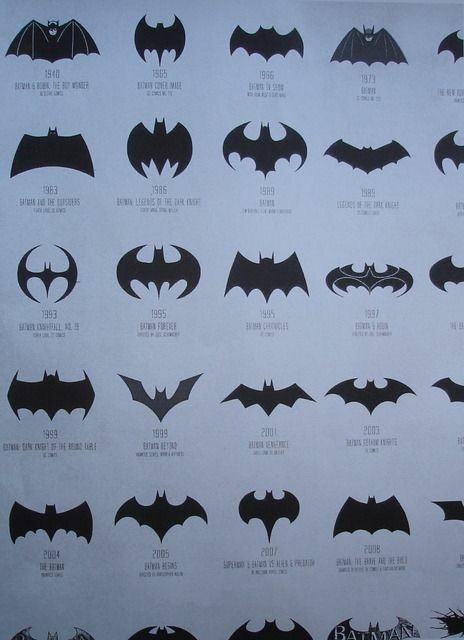 It may be a bit too detailed, but it has convinced everyone to become batty for batman. No one wants to wait in the wings to make these anymore, especially with Halloween right around the corner. The fire department just completed our school fire inspection and I'm happy to say that our shop was one of their favorite places to visit. I was just getting ready to head over to the auditorium to watch the 5th grader's grammar play when they walked in and marveled at all the great projects the students were working on. I could also see them looking closely at the shop details, in the corners, and behind the equipment. I was expecting at least something they might find out of place, but even though they were wide eyed through out the entire ordeal, they said it was much cleaner than they expected to see (not a speck of dust anywhere) and asked if they could come in and work on projects sometime. "Of course you can... anytime you want. We'd be glad to have you." Talk about good news to share! After making this post, I thought it might be important to note here that this was a surprise visit for me, and our shop does not have janitorial service. We in fact rely on the students (and their teacher) to complete all the cleaning duties and I hadn't began my cleaning mode for the week yet. That means the steps we have taken... have simply kept the shop cleaner and when we do clean, it makes cleaning so much easier. ***UPDATE*** 11-20-15 By popular demand... Spider-man. Yahoo.... "Good Robot" who also walks! Larry Thibault has given me more than a few terrific places to look at some great projects. 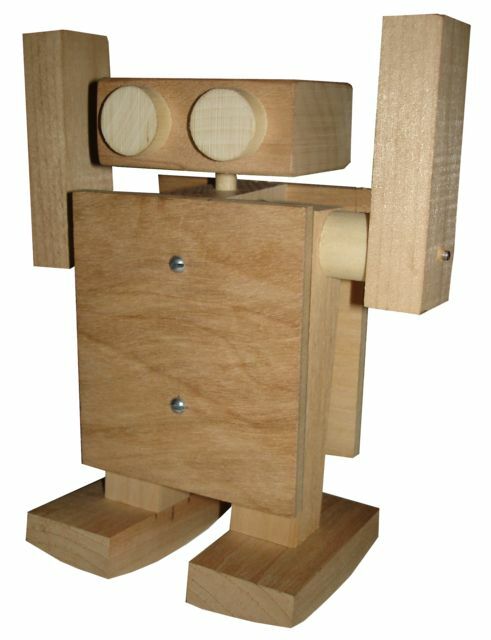 When I saw this walking robot by Roberto Lou Ma, I just knew the students would love making them. I downloaded the video and showed it to all the classes. While they liked it, it wasn't right in front of them and I think three dimensions make a lot of difference. They didn't ask much about it after that. At least the idea was planted in their minds. Where to go to get the plans. Once I found there was a plan, I located and downloaded it and this is how our prototype turned out. It works great too! The screws allow the prototype to be disassembled for clarity (as students may need to see underneath the surface to better understand the construction). Both the front and back panels can be removed. I would have to say that the most difficult part is preparing the feet. They are made on the lathe using the face plate. The wood gets glued to a scrap block with a paper layer between them. The reusable scrap block stays mounted on the face plate and is really only there to hold the screws. This keeps the feet from having screw holes in them. 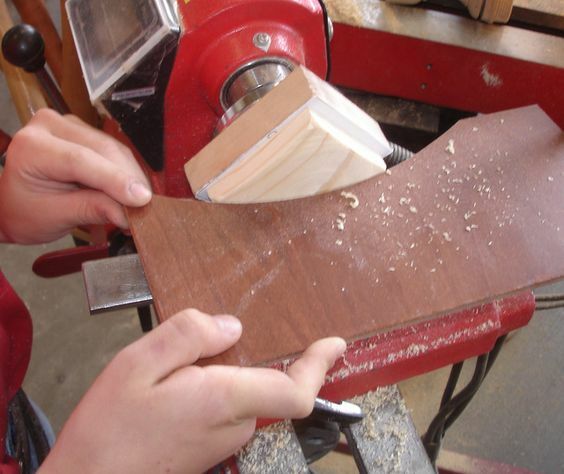 It only takes about 10 minutes before the glue bond is strong enough to begin shaping the feet. The woods surface will get a 7" radius arc making the underside of the feet curved like the bottom of a saucer or plate. The radius template checks the arc. A proper radius is fairly critical to the walking motion allowing the feet to shuffle along the incline without stumbling. The paper layer allows the feet to easily split away from the face plate scrap block. The excess paper is sanded away and the newly formed block gets cut with the grain into two parts, right down the center.... keeping the flat side down on the band saw during the cut. The robot can and will stumble once and a while. I watched a different persons video and they put a spring where a nose might be. When theirs stumbled, the spring action absorbed the shock as it started bouncing on it's nose. It was a very cute addition. Another modification we also made was to not only glue, but also (use the nail gun) to nail each foot in place. I have found that even though some of the students are a little scared to try using the nail gun, they are usually able to safely use it.... with proper supervision of course. Another critical part is the center post which requires an accurately drilled hole for the leg pivot to work properly. The students will have to keep their drill press table clean so the center post remains completely flat during the drilling operation. They also have to keep the hole slightly under size so the pivot rod can be hammered through and stay tight in the center post. Remove the front and back cover for clarity. The robot seems to be shy about walking with it's covers removed. I guess most of us would feel the same way. Actually it's a balance thing where the body simply needs the counter weight to properly stay balanced during walking. After the students asked about whether or not it had a ball bearing, I thought about putting some into it's lower portion to see if that would make it work without the front and back covers. We purposely made the prototypes post thicker than the plan using a harder wood (maple) so it remains sturdy as the students continually handle it. We also used a hardened shaft (left over from disassembling the thumb piano lawn rakes) so the axle isn't easily bent with all the rough handling I'm expecting this prototype to get. For the students, we will have to settle with using hanger wire. Where the plan for the pivot requires drilling 2 coins (such as dimes) for custom made washers, we instead used the slugs that were (knocked out of electrical boxes) swept up after wiring our new new shop space. After drilling an eighth inch centered hole, the slugs were lightly sanded... just enough to make sure they were flat. It's only a slip joint so I'm fairly certain a few small hole fender washers would work just as well. I plan to test this out and if I'm right, I'll buy them in bulk, saving both time and money. The other choice we have is to try drilling holes through pennies. When washers can cost 10 cents or more, pennies sure seem like a frugal choice. Do you think we might get in trouble for defacing pennies? ***UPDATE*** I was asked if you can make the washers from plastic. I was simply going off the plans except instead of dimes, I used slugs. I think if you have access to plastic that it would probably work. I've been "talking the talk", now to make it "walk the walk". We found the written walking instructions were confusing at best. Our best way of making it take off walking down the 40" incline every single time we tried... was to raise the high end of the incline to 3 3/8" and then by slightly tilting the robot to one side (right or left) so it is barely raised up on only one foot (which allows one leg to swing free), it is then allowed to drop back down onto both feet causing the body to start teetering from side to side. Once that side to side motion starts, it just continues to happily waddle down the plank usually with an unpredictable zigzag this way and that way. One eerie side note.... When we turned the robot's head to look at the kids as he was walking by, the turned head combined with the zigzag walking motion made it appear as if the robot was sensing the people around it and trying to keep it's eyes on them. Everyone who was there at the time noticed it too. It created a lot of excitement. This peculiar action is what made some of he students ask if there were a ball bearings in the robot. Changing the center of gravity changes the walk. We also found that changing position of the arms changes the center of gravity and raising them seemed to make ours walk even better. In fact, everyone who saw it today simply couldn't believe it. It's almost too bad it's fall break next week, because it really got the students charged up. Talk about motivation. Here might be another example where counter weight ball bearings could make the walk different. Can a teacher have any more fun than this? When the Principal came by the other day, she saw pieces of the robot prototype laying all over the table and made a playful comment about how fun it must be to get paid to play all day long... and my reply.... I like to think of this as research and development as I explained the project to her. She proceeded to thank me for all I do at their school and I have to tell you the truth... it feels good to be in a place where you are sincerely appreciated! I believe this is what is fueling creativity at this fantastic school. Teachers all around me are working their hearts out for these kids and I just want to keep up with them. 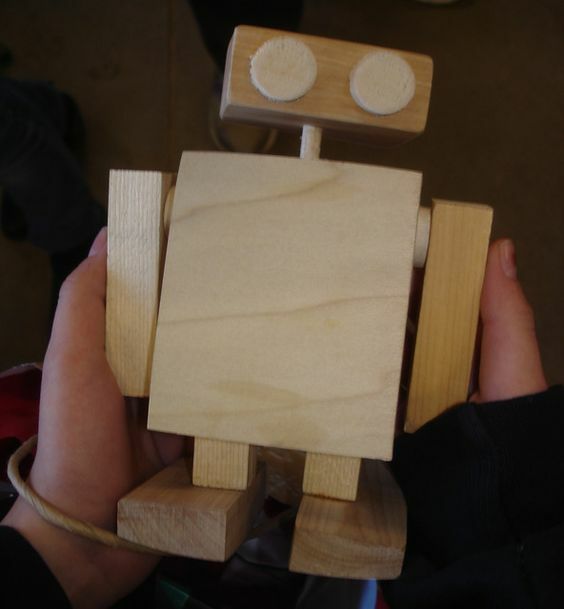 ***UPDATE*** 12-18-15 After much effort, and after being absent from class a few times, this third year wood shop project prolific 6th grader finally completes (one of the many... but) probably the best example so far, of the walking robot. She cut everything out on the bandsaw. The hanger material and electrical box slugs worked for the pivot points. 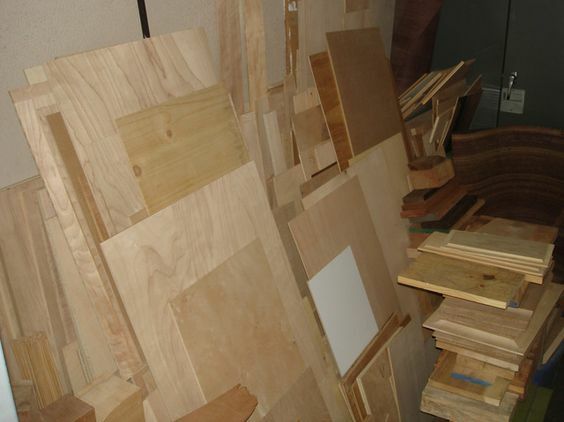 I went over to the school today to deliver a load of mostly 3/4" veneer core plywood scraps given to me by various people who know we need the material. It's been in my truck for weeks and my sciatica has made unloading it unbearable until now. The time off has given me enough of a break that it finally seems to be calming down. 3/4" veneer core plywood is perfect for making the ping pong shooter (shown in pane 10) which is definitely one of our favorite projects around here. MDF and particleboard core just don't work nearly as well since they can easily break apart where the material runs thin in projects like the ping pong shooter. Because of this we often run out of veneer core. I got to thinking about this you tube video that shows up on the list next to the robot. 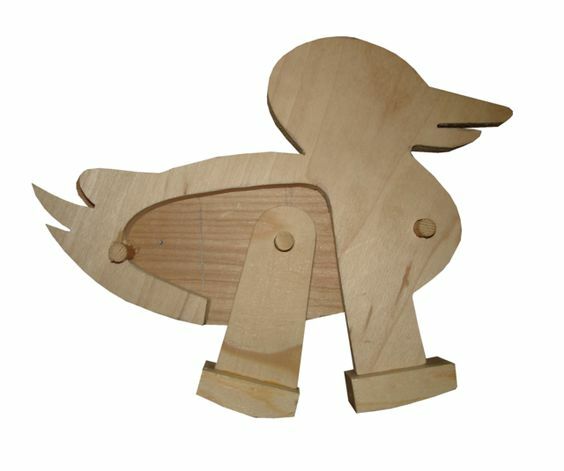 It's another animated toy and there is at least one more... an animated walking duck toy that was posted by a physics teacher... that I want to try.... but for today, here's the hopping kangaroo prototype made completely from small scrap out of our own scrap box throwaways. 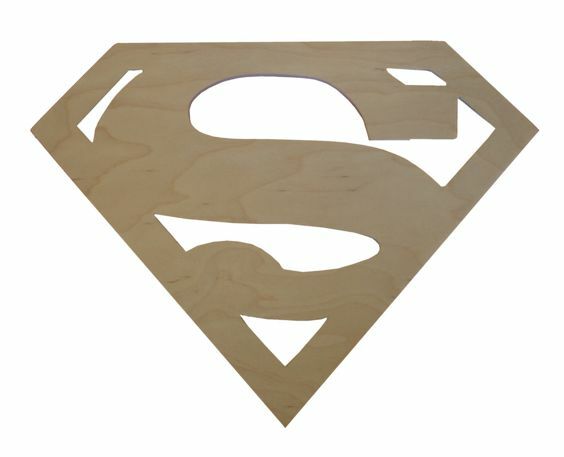 It can be made from 1/2" or 3/4" MDF, particle board, or even solid wood if you have enough around. Heavier might be better as I had to hike up the incline angle to get this one to work. It is also easy to vary the size. Ours is only about 7" long, but by copying and pasting the design into a WORD document, you can make it larger or smaller simply by altering the image size to fit your wood scrapes. This is where to find the plan. We chose to use leg 2 for a shorter hop (as shown in the video) and added a strip of sandpaper to the front leg to keep the toy from slipping at a critical point in the hop animation. We used a 1/4" dowel and two small washers to reduce friction at the pivot, and a shortened nail shaft for the leg travel limiter. I attempted making it with leg 1 twice with little luck. This plan was a little difficult to keep aligned and later make hop. If you have to trace your template directly from the computer screen like I did, this image might make that easier. With the back ground removed, it really stands out and easily shows through the paper. I was only forced to trace my outlines on the computer screen because the office was locked up. I had no way to print it out, and being difficult to see through the scrap paper I had on hand, the hole may have ended up slightly out of alignment. I only discovered this when I had to add a small screw underneath to shorten the leg travel by moving the front stop inward a fairly significant amount. That fix made it run much better. Later as I was finally able to print out the pattern, I found I had not misplaced the hole. The misalignment must be related to using a nail instead of a barbecue skewer as the step limiter. This http://www.instructables.com image shows a variety of bunnies that can also be made from the same design. I really like the center one at the bottom. It tells me maybe I'm not the only one to make a possible drilling error. 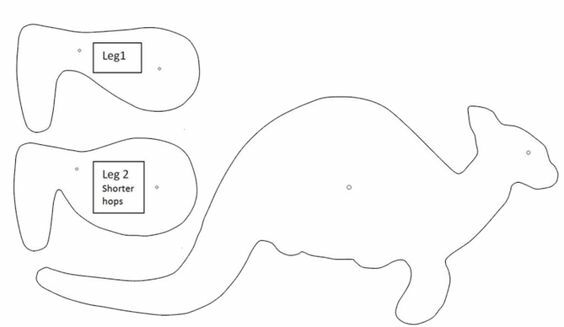 I will have to make templates of some of these variations and also one of the dinosaur shown at the top of their page, and leave it up to the kids imaginations to come up with their own variations as some of them have proven to be capable of doing when they really like a project. Anyone want a grasshopper? While this toy is much easier to make than the robot and is a good place to start with making animated toys, it is a little harder to make it actually work. Raise the incline and make it hop. This one not only has difficulty with low inclines, but also tends to sometimes drift to the right and I'm not sure why. We had to raise our 40" long incline another inch (making it 4 3/8") in order for it to work properly. 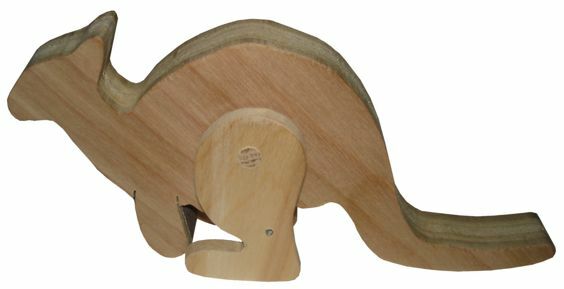 At the top of the incline, face the kangaroo in the direction of travel (downward) and pull back on the tail until the feet are as far forward as they can travel, then let go. It should keep on hopping all the way to the bottom as long as it isn't drifting to one side or the other. I can't wait for fall break to be over so I can show this to the kids. I think it will be popular because of how cool it looks when it does hop down the ramp, but the alignment issues are going to make it a lesson in frustration as well. ***UPDATE*** This has been a very successful project and students seem to enjoy it. Some take it to the extreme and make several bodies or legs until they get it just right, and some go as far as to create a ramp. As I was looking through the variety of on-line animated toy ideas, I noticed this educational video where a science teacher uses a toy duck to explain the physics involving friction, impact, energy transfer, and dynamics. While this is a great way to discuss these concepts, I just liked the way the toy moves down the incline. The problem is that there is only a reference to where the toy was purchased. Nope... no plans... and no amount of on-line searching could uncover a suitable plan. I had to make this prototype completely from scratch, using only what I could see while viewing the video. That only makes it more fun for me as I go about experimenting with what should work, what could work and in the end what does and doesn't work. Here are the results of this afternoons experimentation. This example is held together only using unglued 1/4" pegs, so the top cover can not only be removed revealing the inner workings, but the entire model can be disassembled so parts can be further inspected, touched, and quite simply viewed from any angle. The balance is partly obtained by removing some of the inner tail weight. I chose to make the front leg solid to the head and body and to attach wings instead of relying on painted wings. The extra 1/4" layer can also can help with balance and inertia. The pivoting leg is sanded a little to reduce it's thickness. I might also want to add some washers to the pivot. 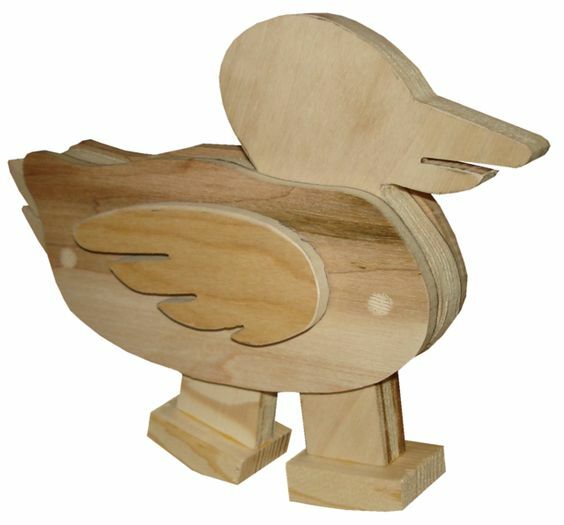 Although the duck already works just like the video (with one exception... this duck has a slightly tapered back foot which increases the tipping point and makes it appear less clumsy as it walks or waddles... in my opinion... much smoother). I found it a little amazing how well a lower 40" long incline (set at 3 3/8" or the same as what is used for the walking robot) actually makes it work better, and that is not what I expected after working with the kangaroo. It is not as complicated as it looks. At least, not with a set of templates that I cut. After setting it in the direction of travel (downward), balance it on it's back foot with the front foot raised off the incline. From this starting position, give it a little encouragement (push on the back of it's head) to drop it onto it's front foot and watch it go all the way down the incline. ***UPDATE*** 11-4-15 We are off and running with plenty of students wanting to make these motion toys. This one belongs to a 6th grader. As she found out from testing her project... the shapes of the feet (not shown yet) were critical in how well and how straight it ends up walking. Her first try sent the toy tumbling over backwards. After making a longer back foot, it then veered to the left and wouldn't make it more than a few inches before coming to a complete stop at the ramps edge. If it had kept going it probably would have done a complete U-turn. By sanding the already installed feet on a large upright belt sander, she was able to straighten out the walk and get it all the way down the ramp. It doesn't help that we have had a lot of extra rain we rarely see around here. Joints that were made when it was dry don't work nearly as well once the humidity swells them... even a little. It's a far cry from just a few years ago when I would plan my high school car shows... held during the third week of November, and end up with a nice warm day around here. I'm not complaining mind you. We desperately need the moisture. The Prescott Area Woodturners had this posted on page 2 of their July/August 2014 newsletter which I just ran across. This would be when she was a 7th grader... now high school. Our initial donation to Franklin Phonetic School continues to bear fruit. This proud note comes from W Spencer: "My housekeeper’s daughter goes to Franklin Phonetic School and she brought a project she completed for me to see. 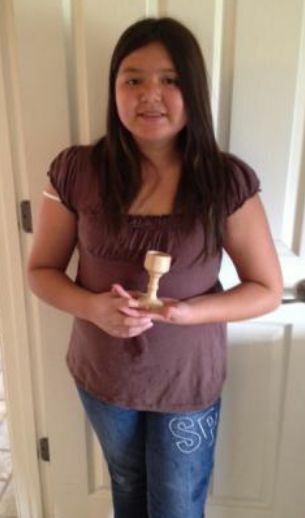 She had the biggest smile on her and she said that woodturning was her favorite subject. It’s nice to actually see some results from the Club's educational efforts." 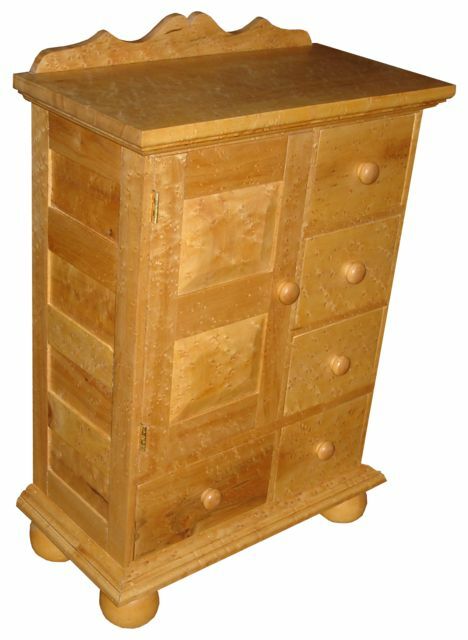 A very good reason to recycle old or discarded wood products. This page was generated in 0.994 seconds.